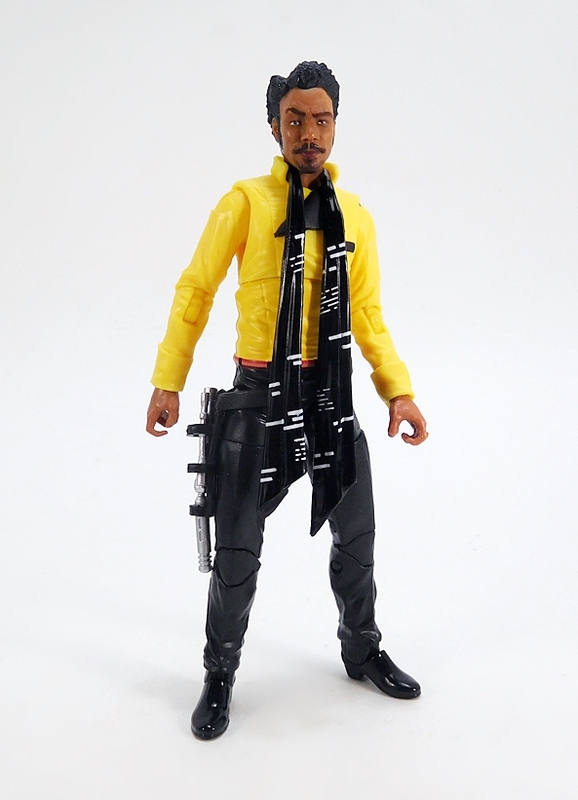 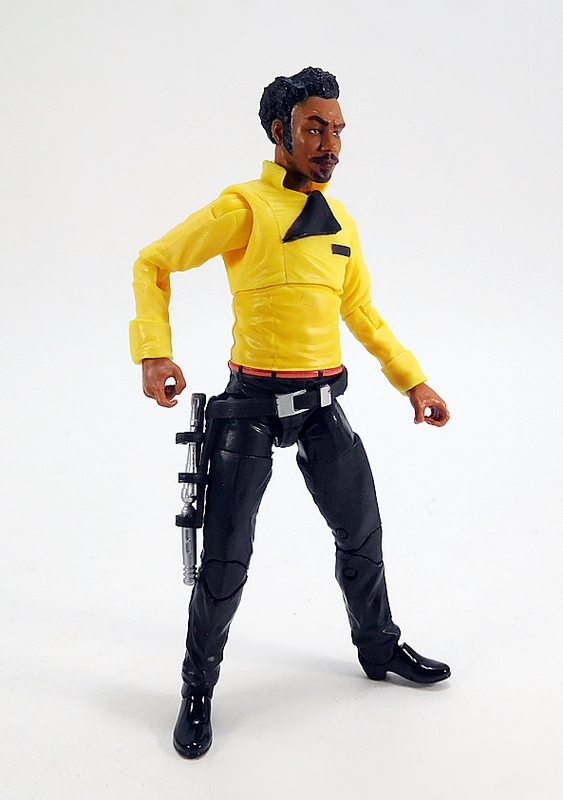 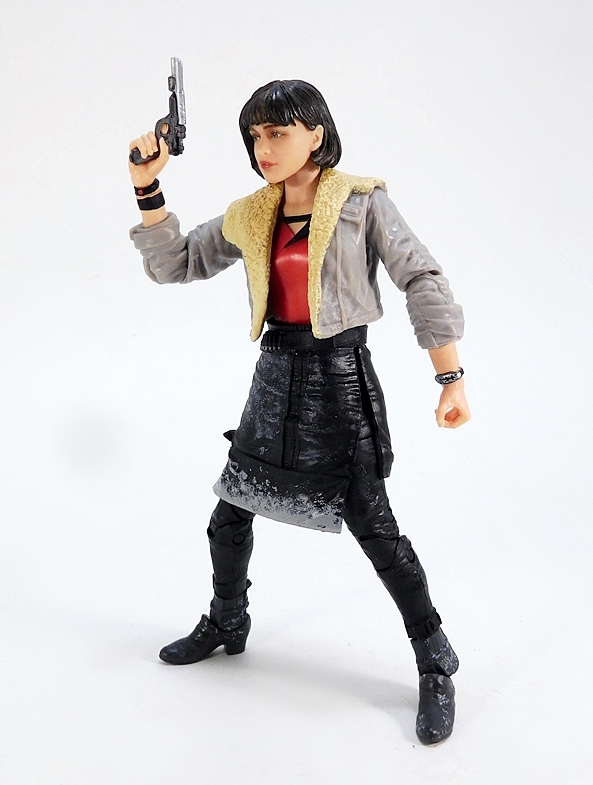 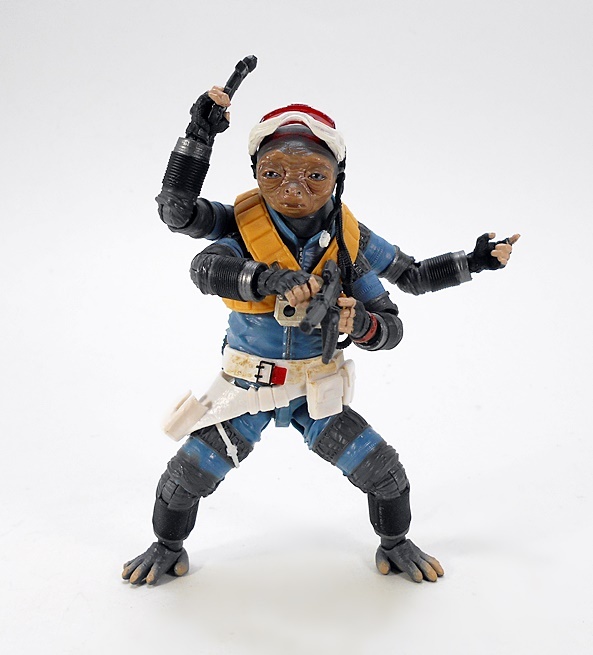 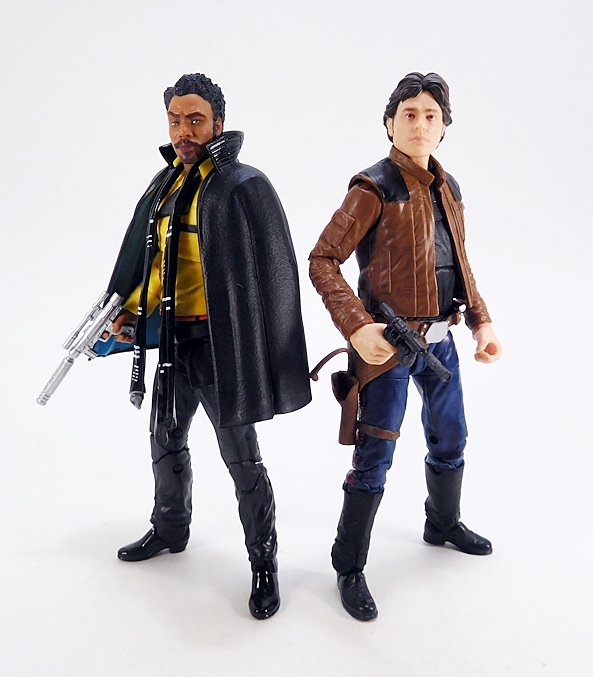 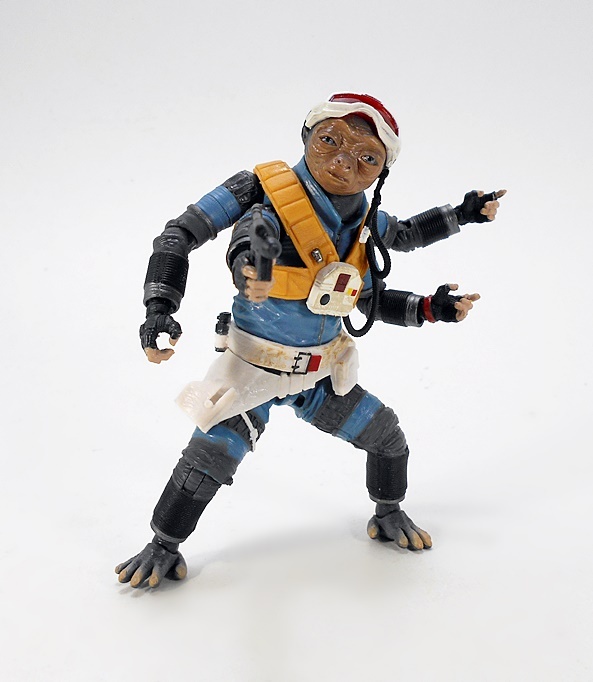 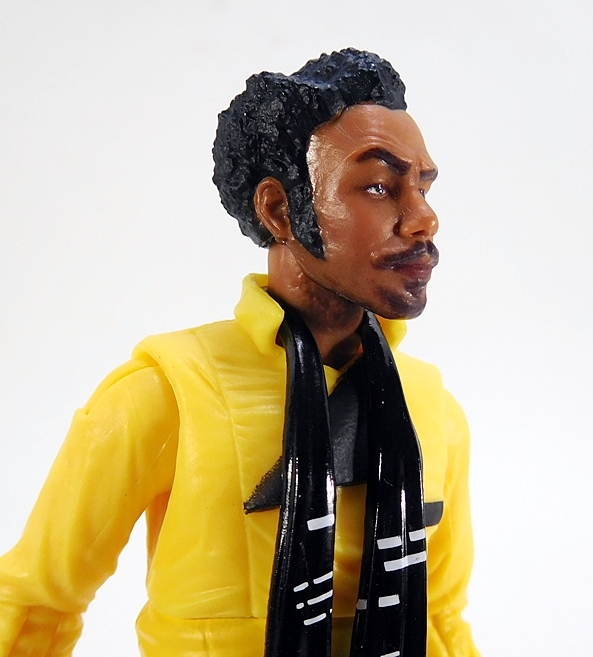 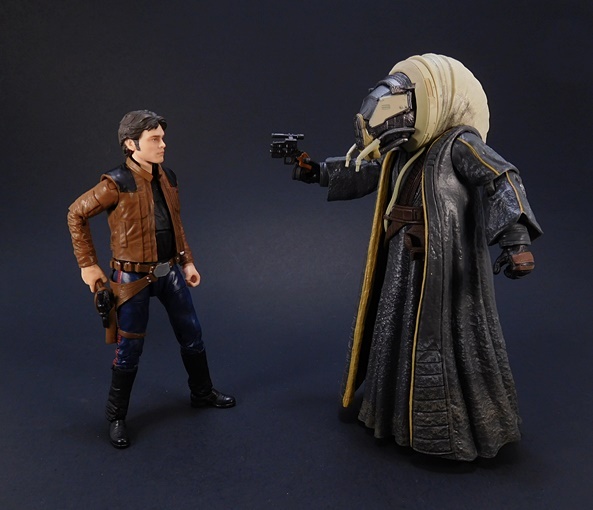 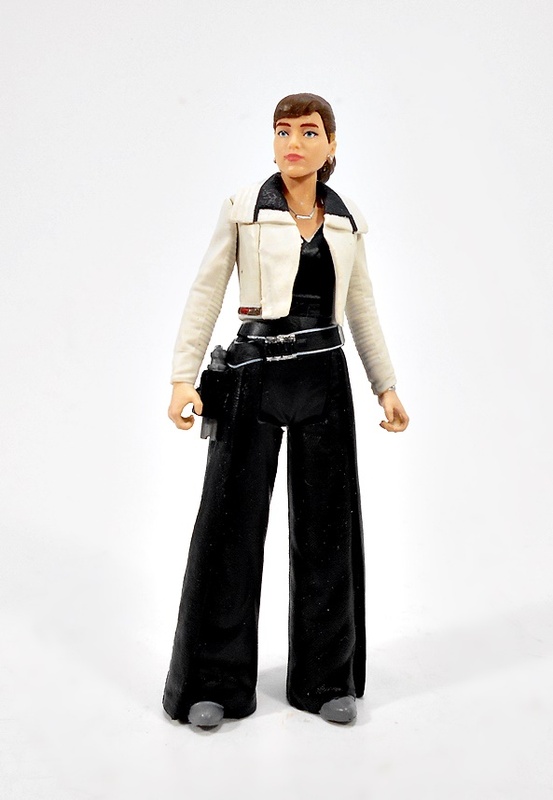 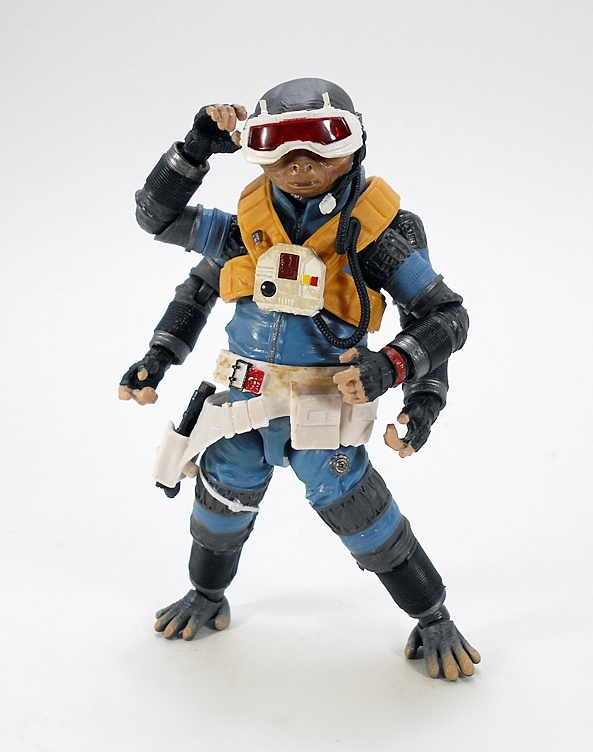 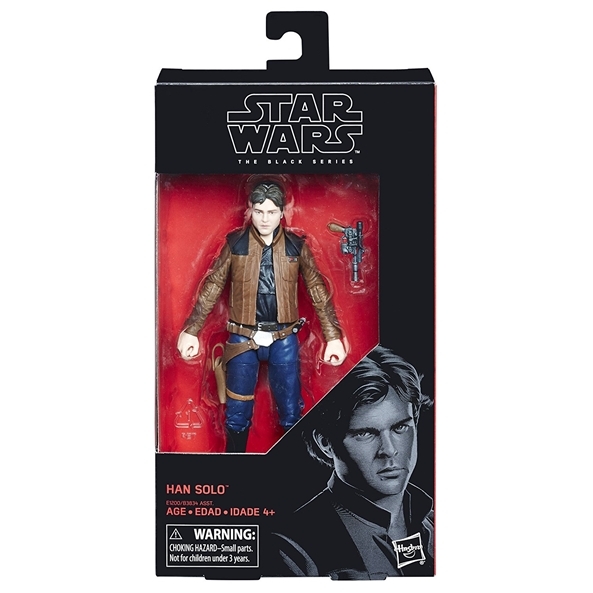 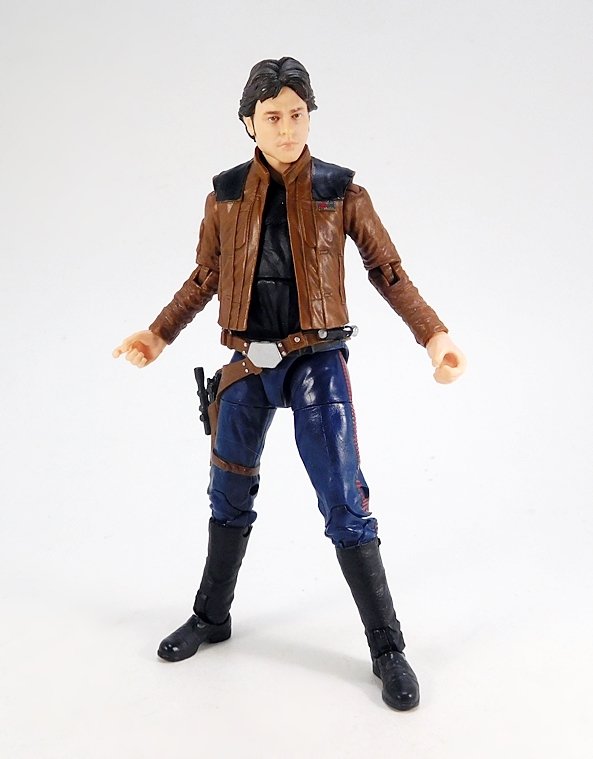 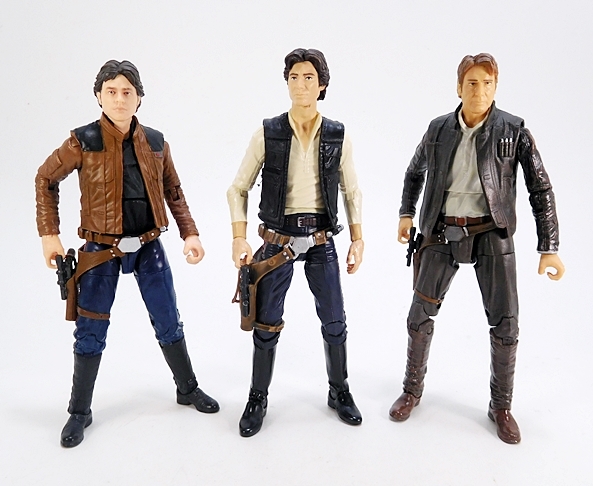 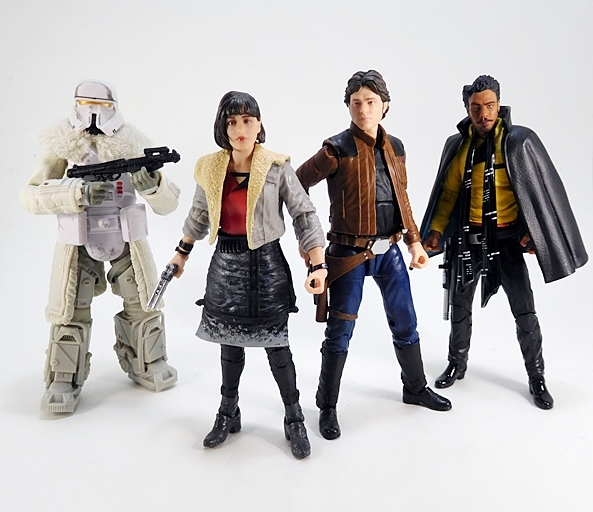 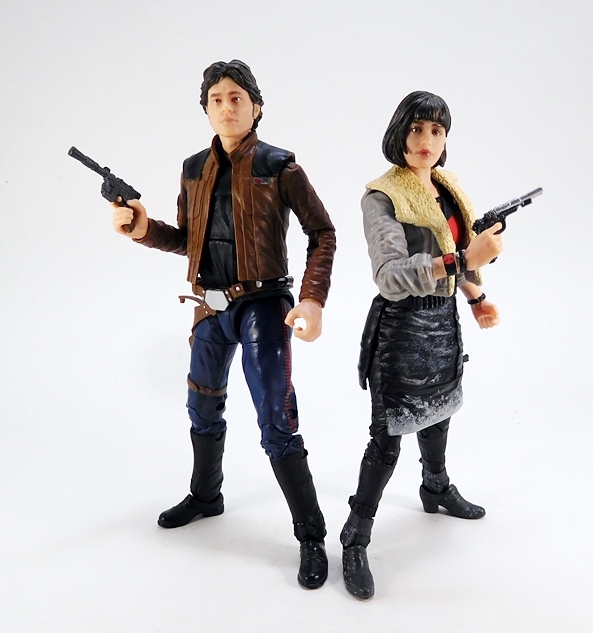 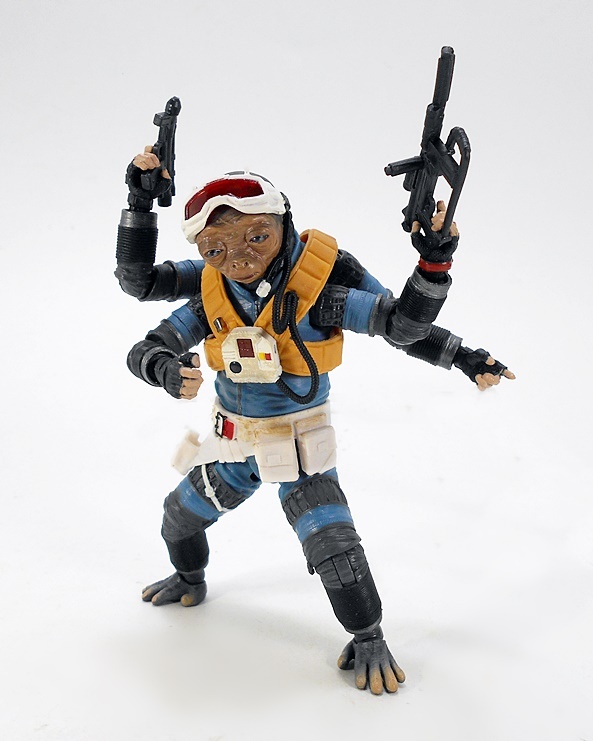 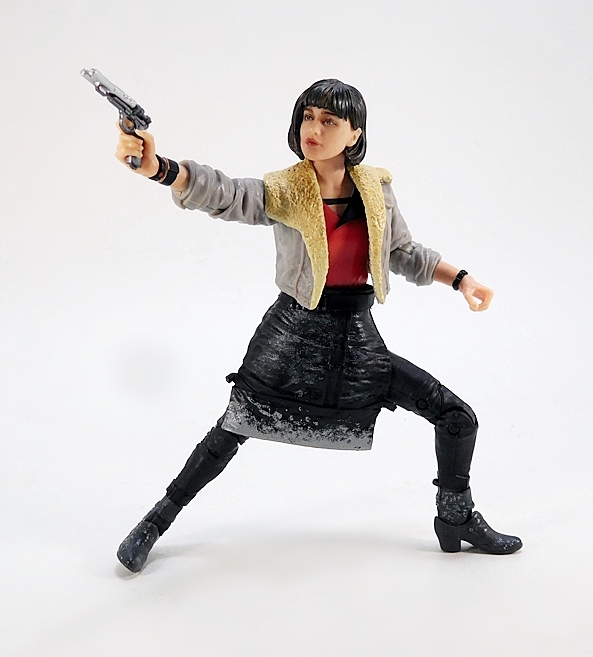 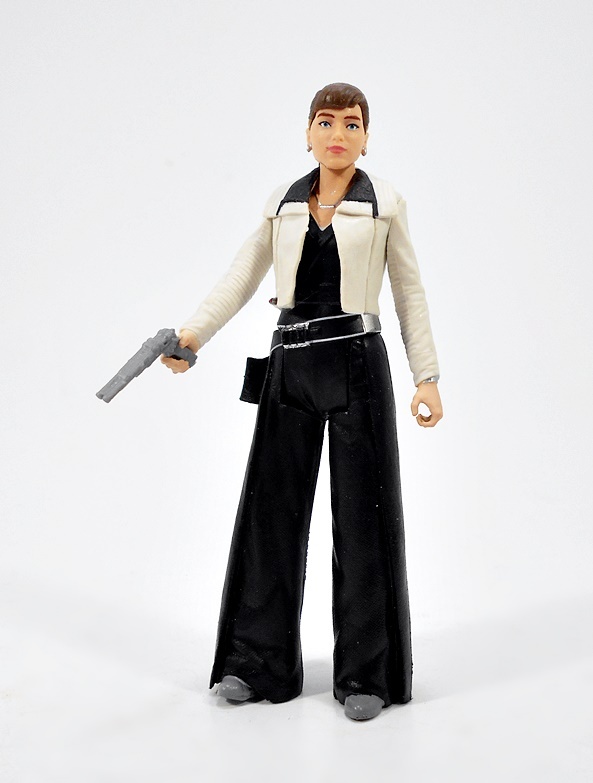 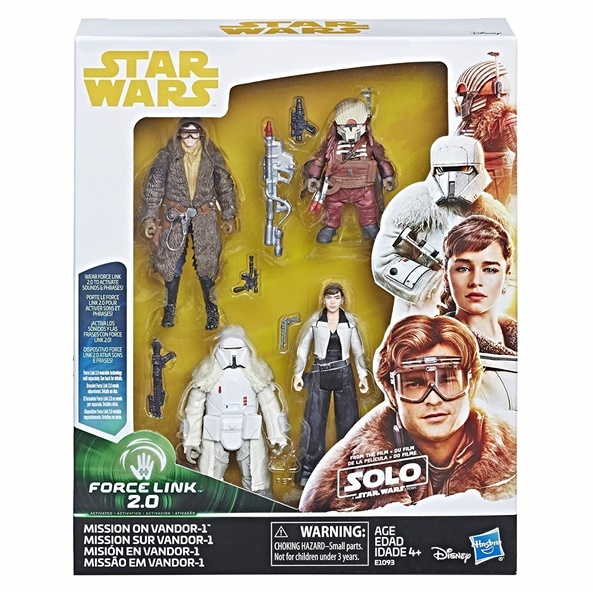 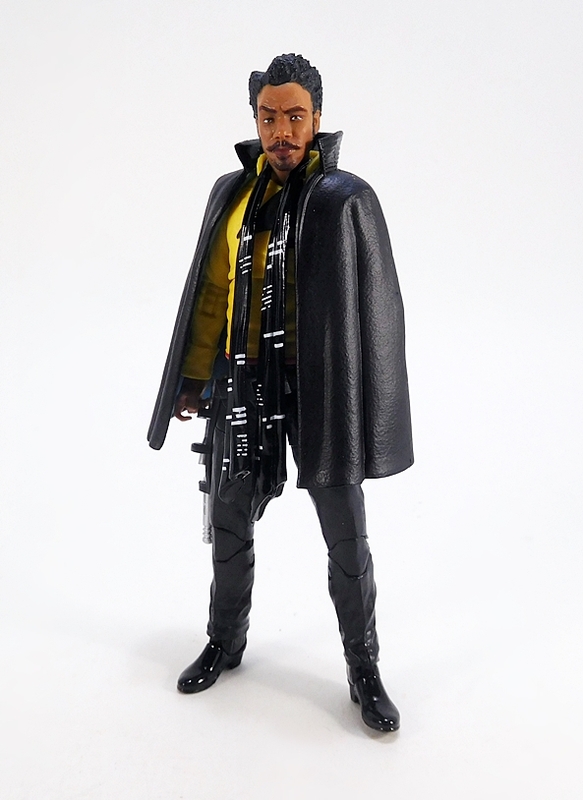 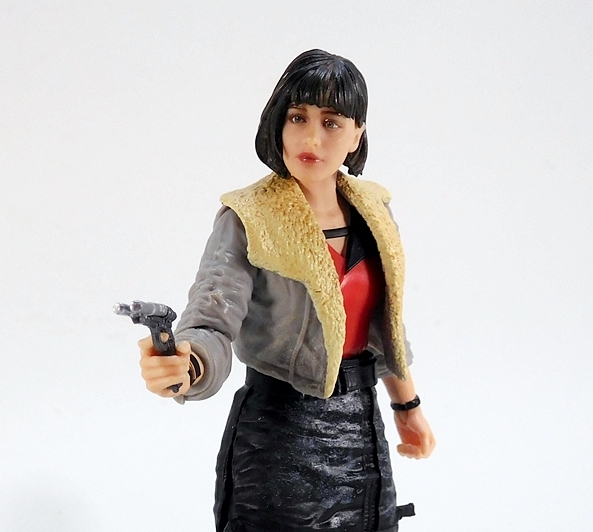 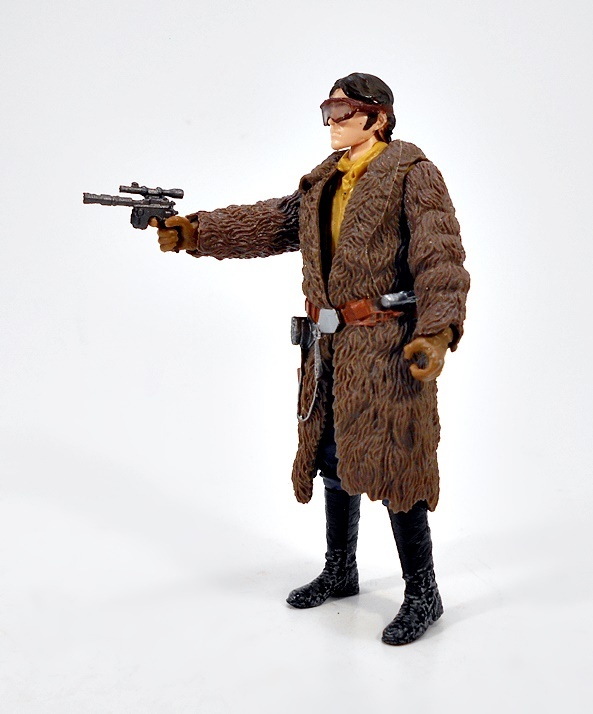 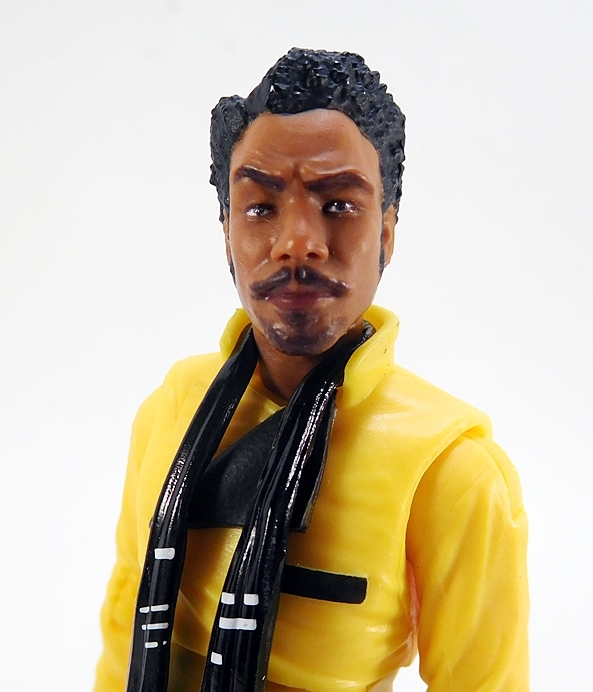 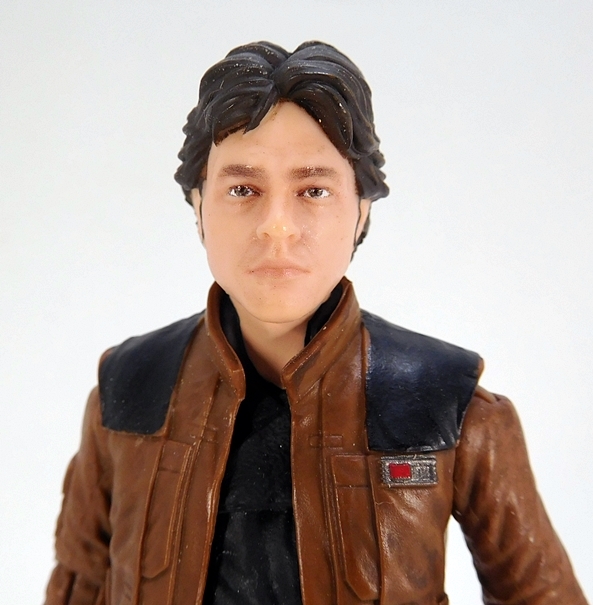 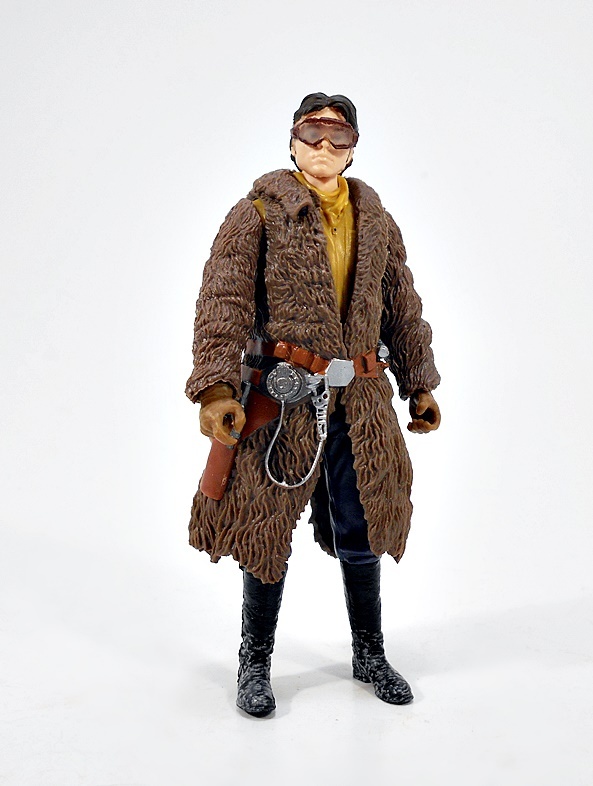 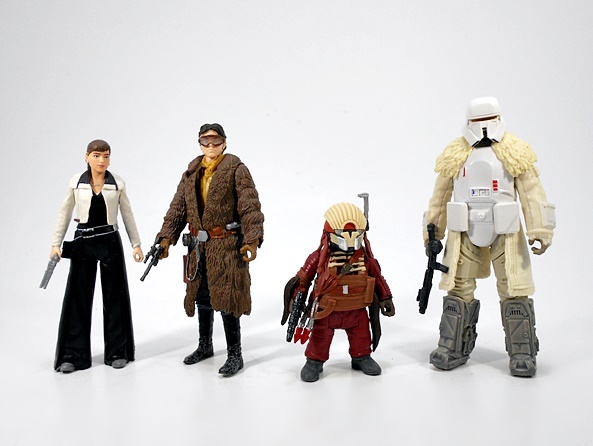 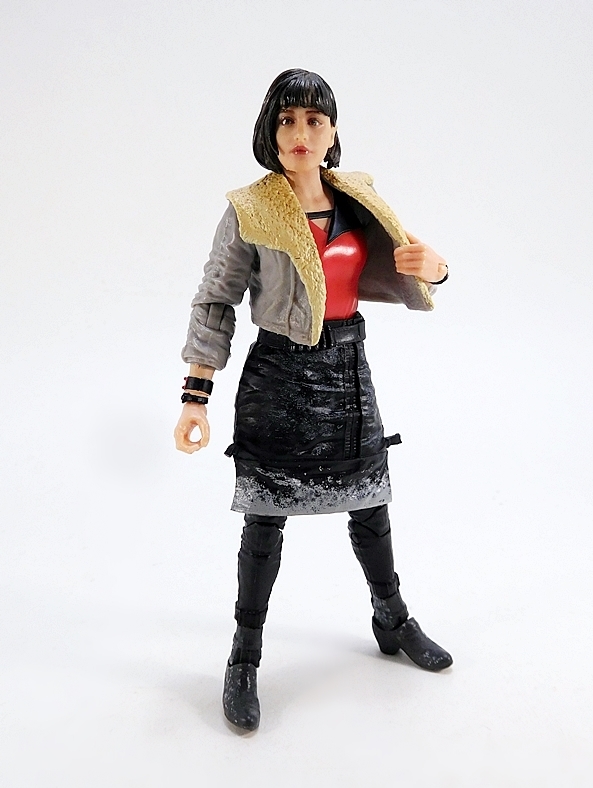 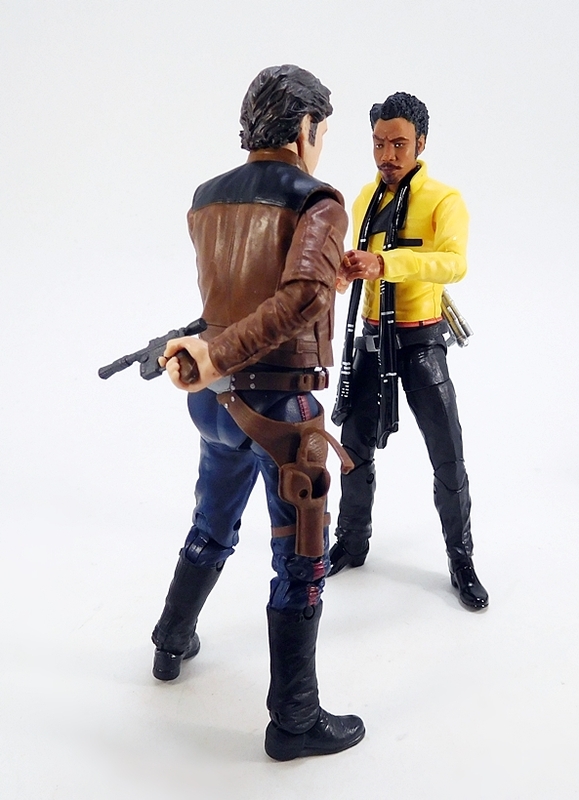 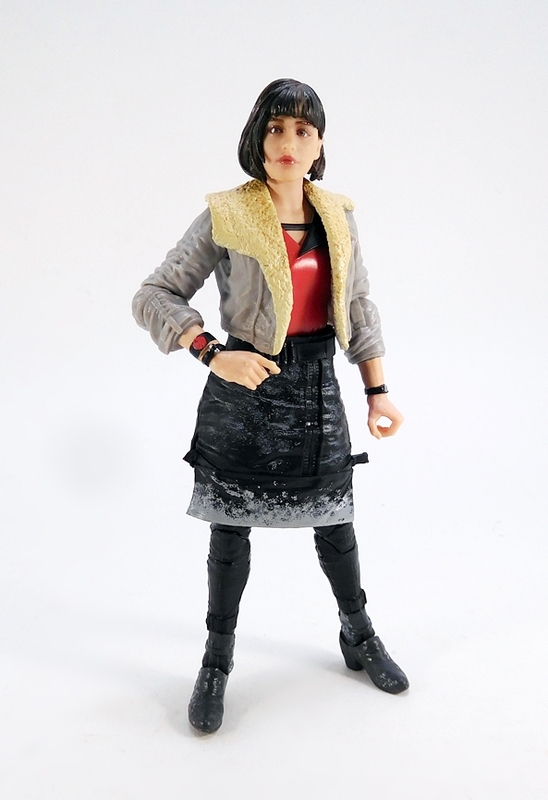 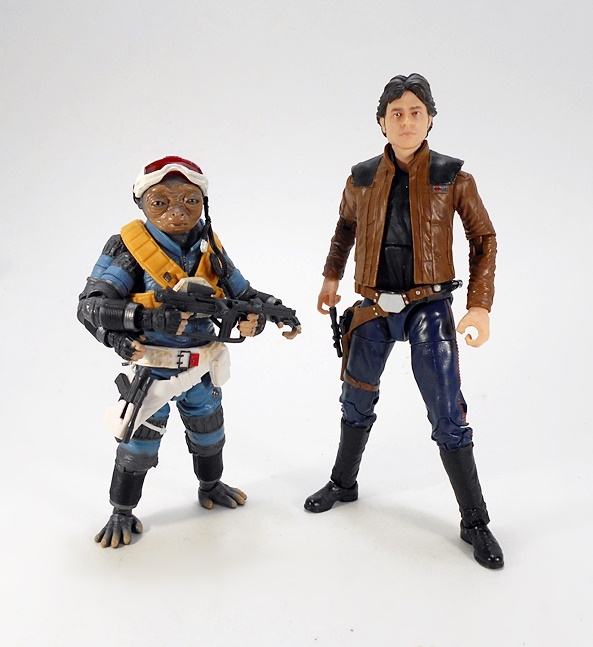 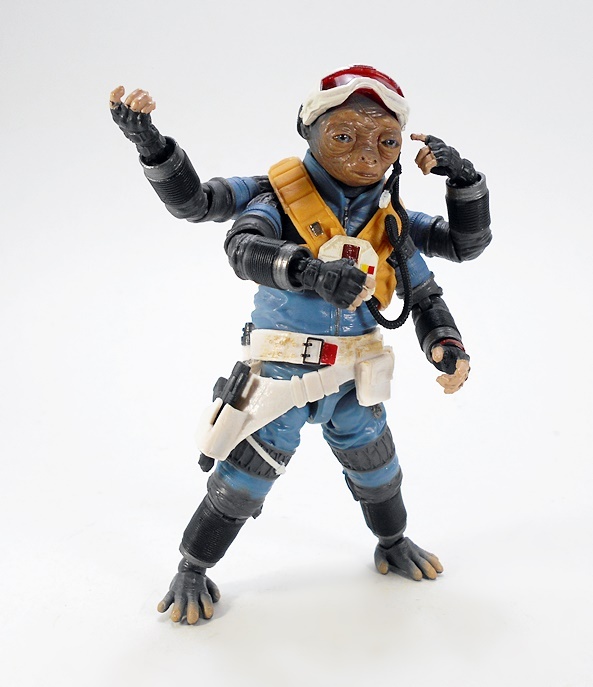 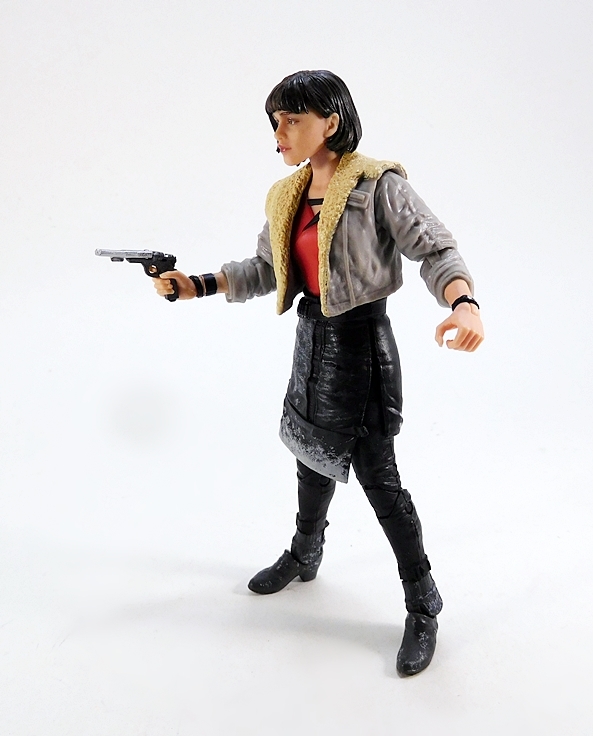 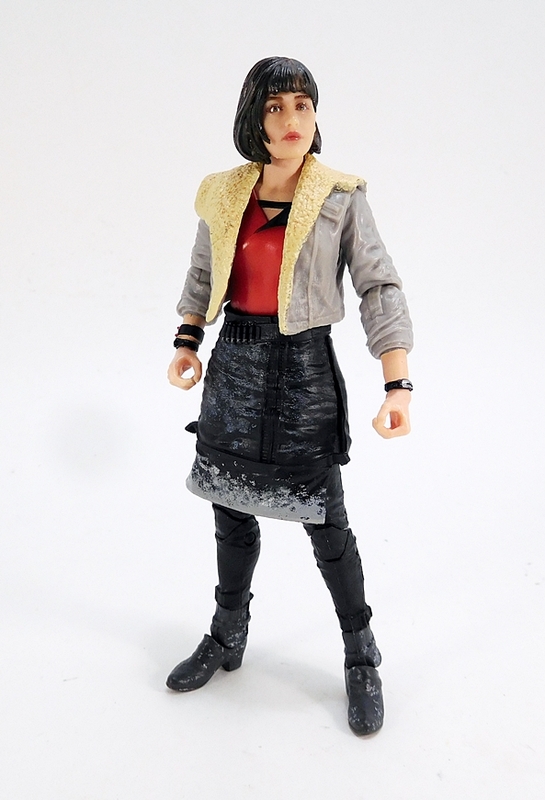 Solo may have had disappointing returns at the Box Office, but I enjoyed the hell out of it, and Hasbro is still supporting it with their 6-inch Black Series. 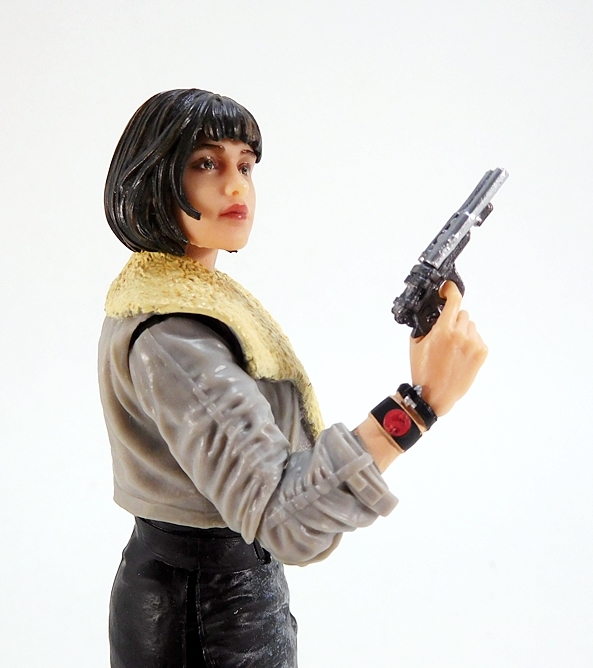 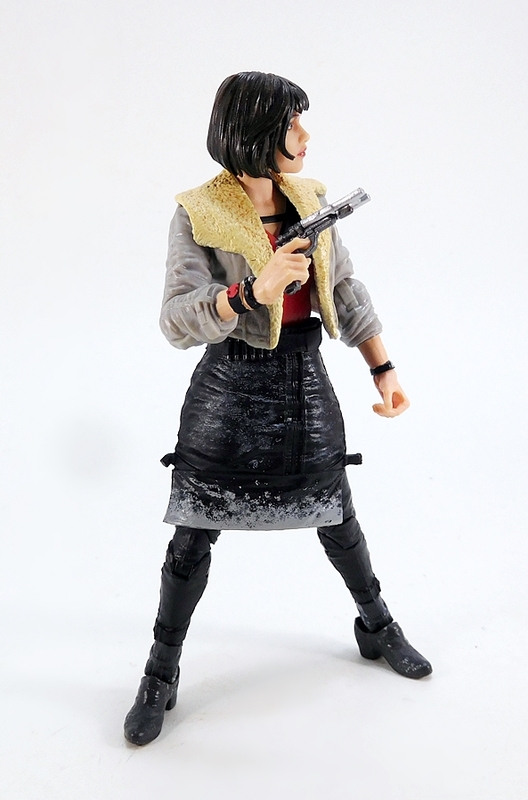 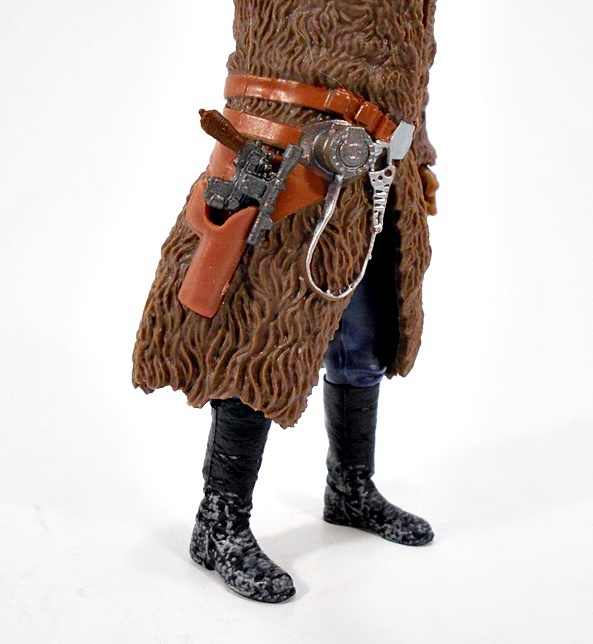 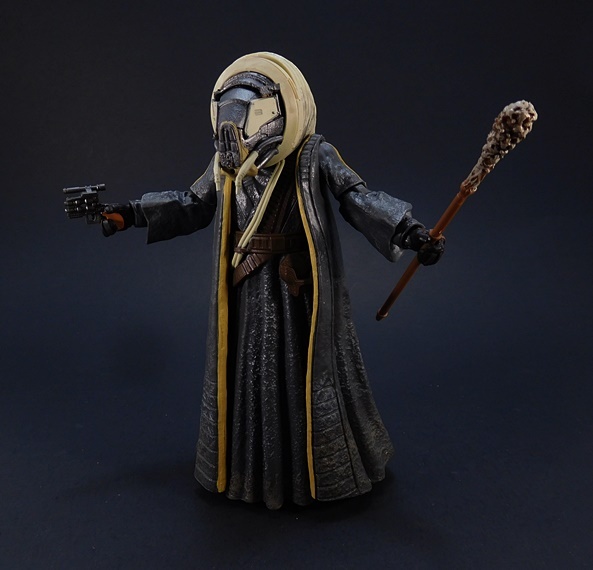 Not only are we getting a second wave of figures hitting soon, and not long around the film’s home release, but Target is offering a Deluxe Exclusive of Moloch, the Grindalid Enforcer of the White Worms! 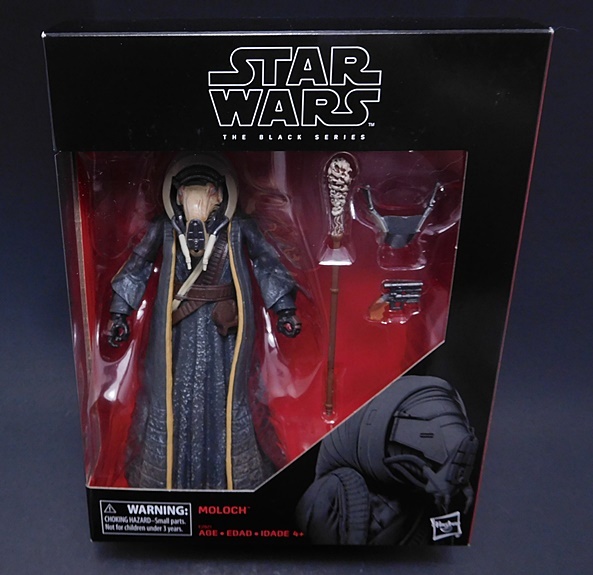 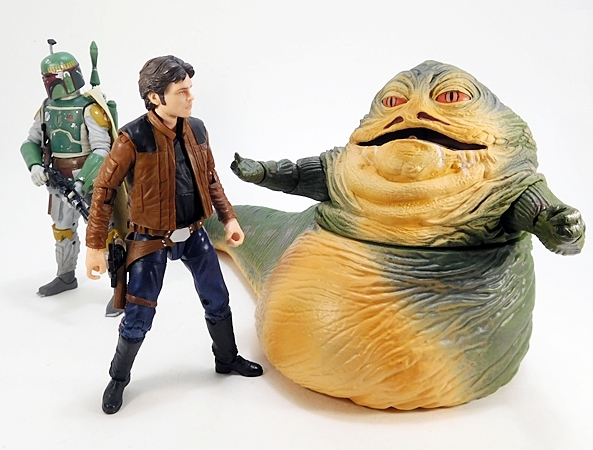 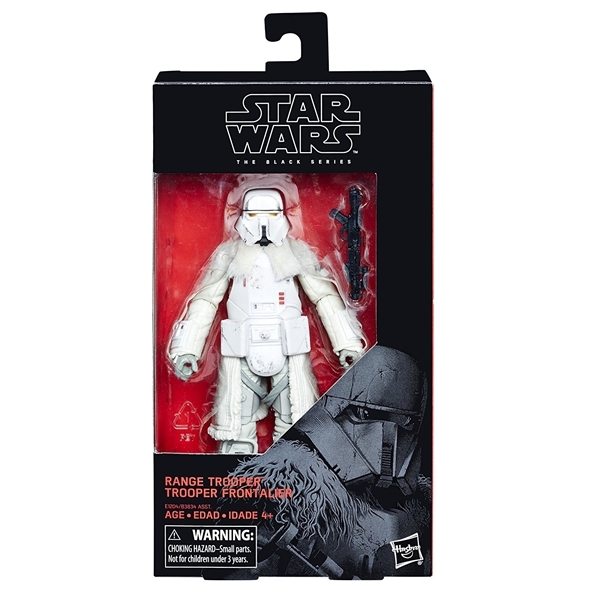 Like Target’s other Black Series Exclusive, Moloch comes in a larger, bulkier version of the standard Black Series box. 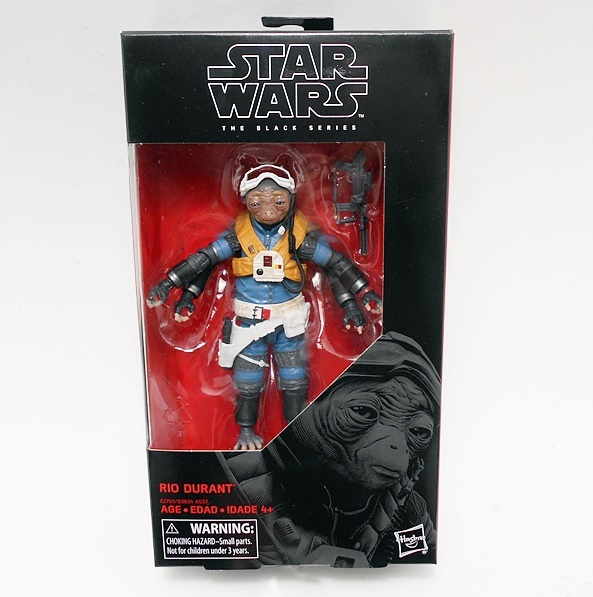 As this is an exclusive, there’s no number on the side, but you do get a little bio blurb on the back and the package is totally collector friendly. 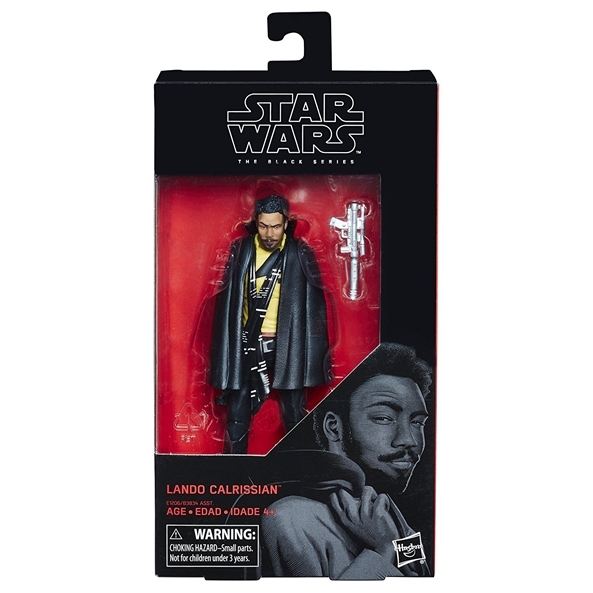 The wider box allows this larger figure to be viewed through the window beside his accessories and I think he displays great in the package. 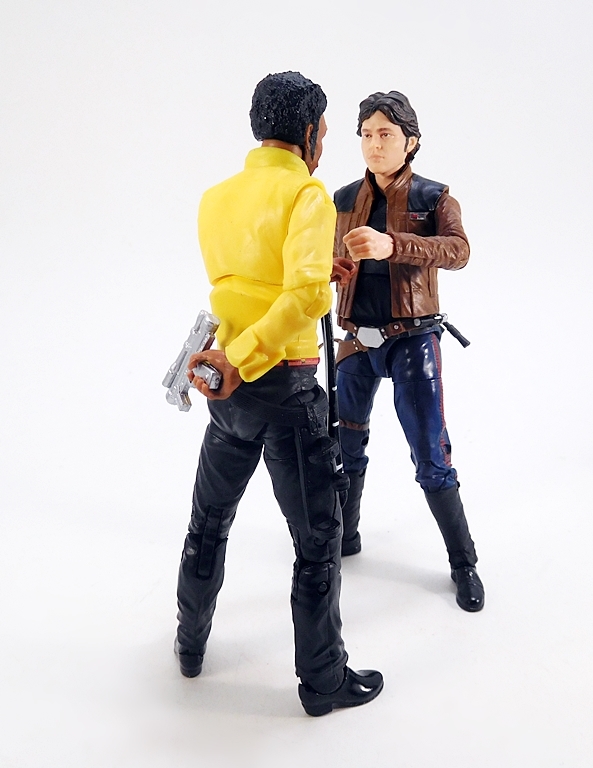 I may actually keep this box! 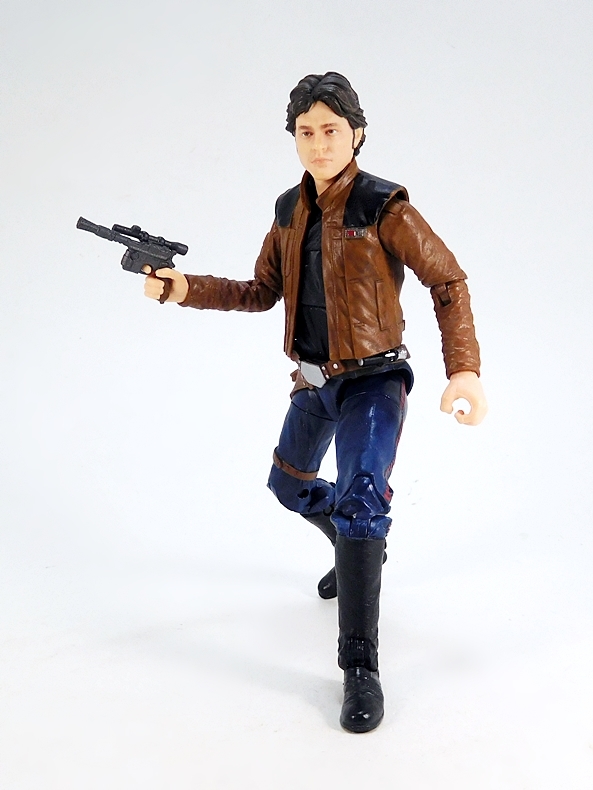 And he’s not too shabby out of the box either! 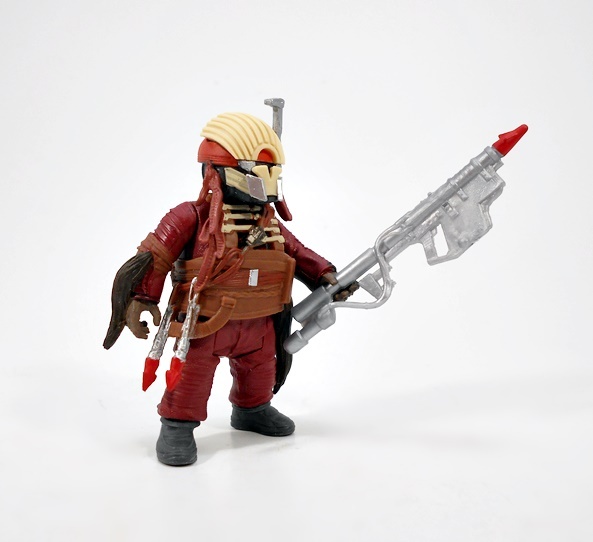 I thought this Moloch had a cool design in the film and Hasbro has translated it to action figure form quite nicely. 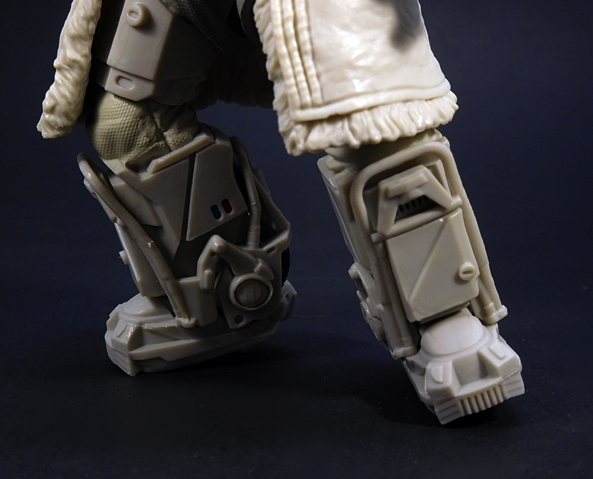 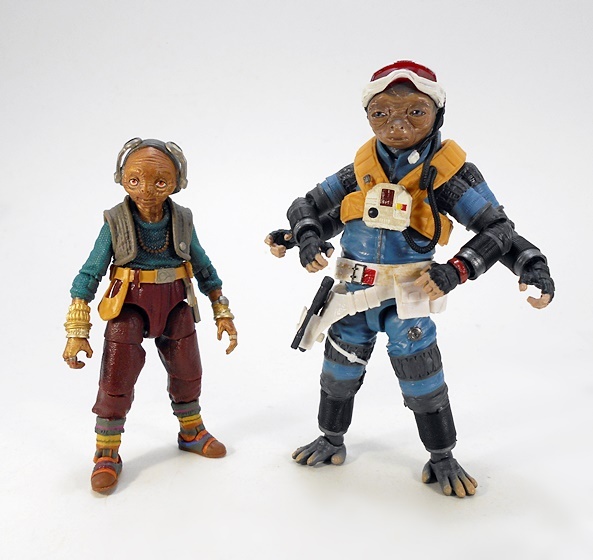 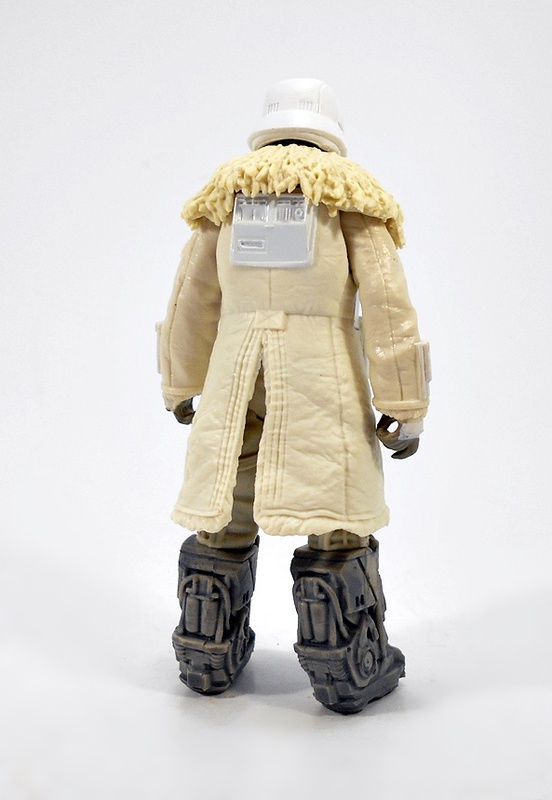 He has sculpted plastic robes with a an additional layer cast in a sleeveless soft plastic with the sleeves sculpted onto the arms. 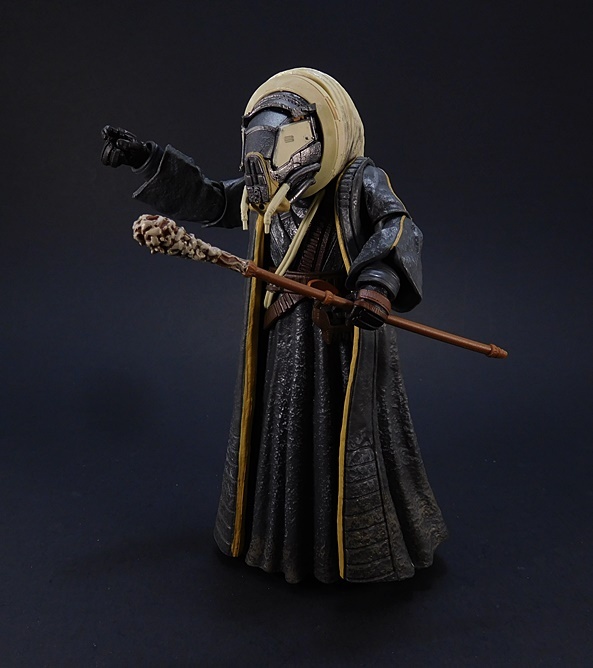 It gives the figure’s outfit a lot of depth and the robes themselves feature some texturing as well as sculpted stitch lines. 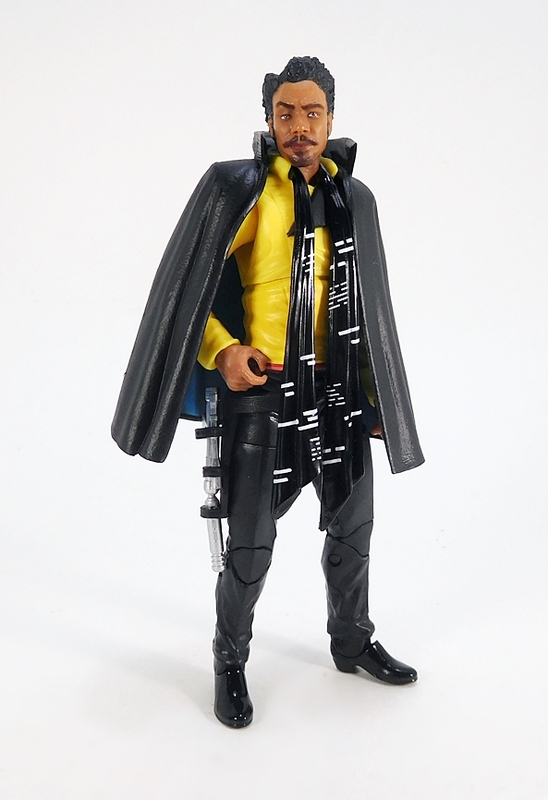 You can even see his sleeves protruding from the shorter sleeves of the robe. 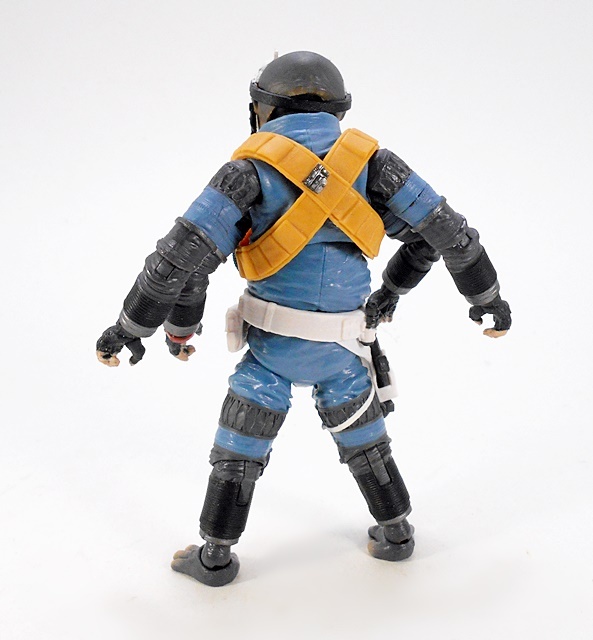 He’s also wearing sculpted gloves with reinforced leather-like patches on the backs of his hands. 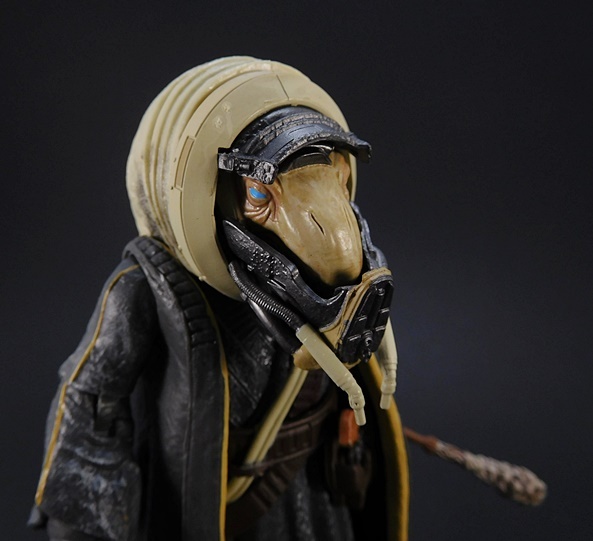 Moloch looks like a humanoid, but looks can be deceiving. 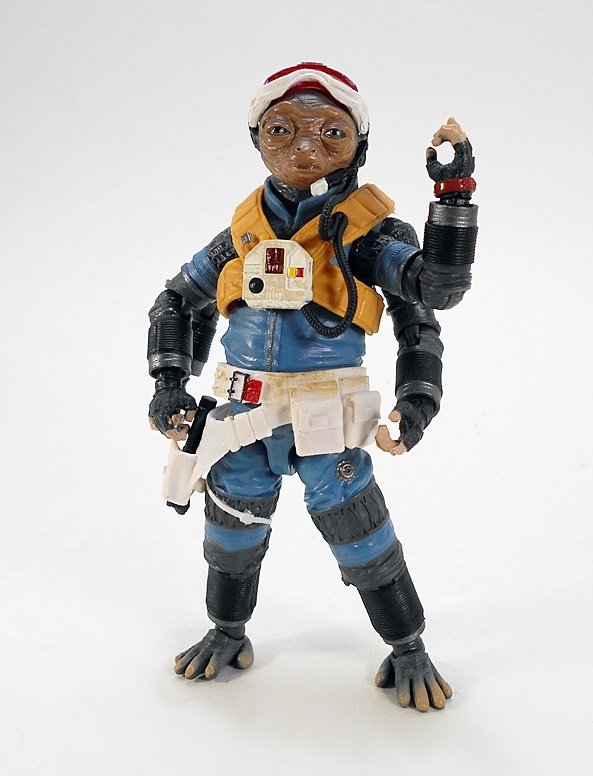 He’s apparently the same species as Lady Proxima, and that means that he’s really just a big worm with arms. 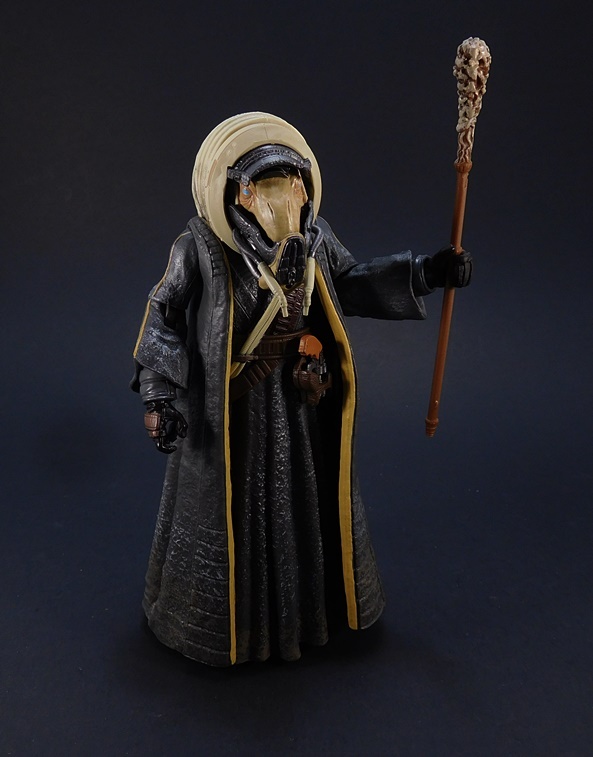 If you peek under the robes, you won’t see legs, but just a big, bloated worm body and I really dig that. 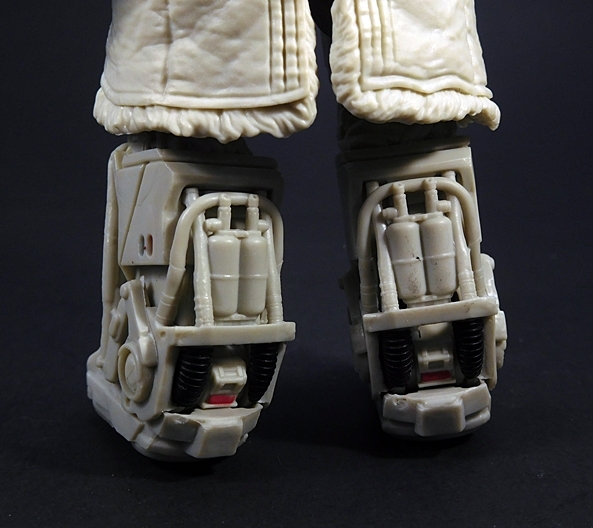 The stubby worm legs actually run all the way up his body. 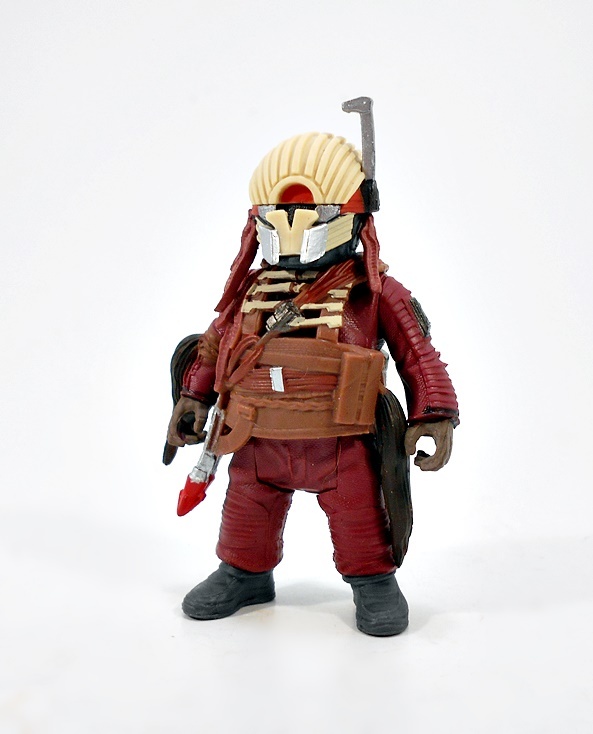 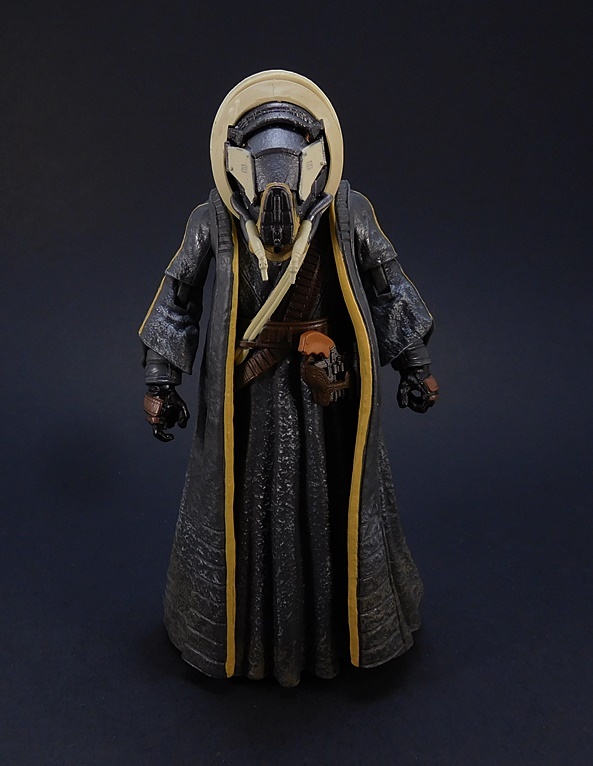 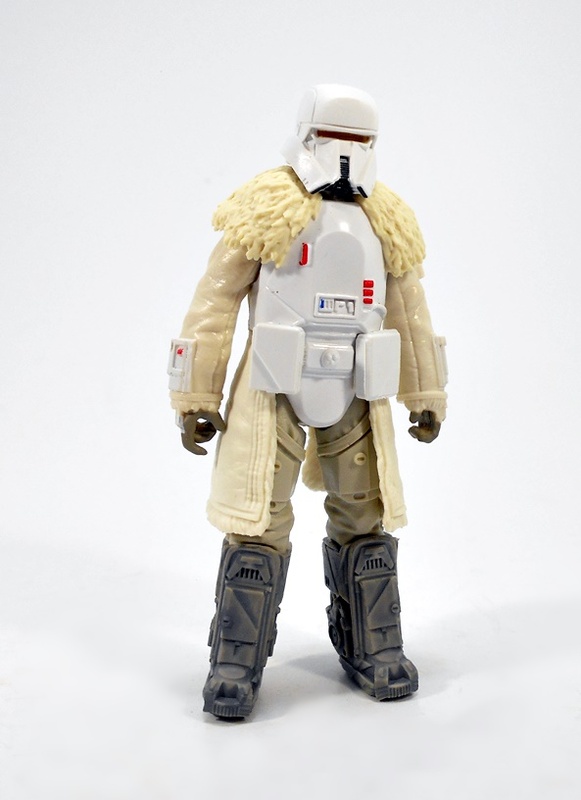 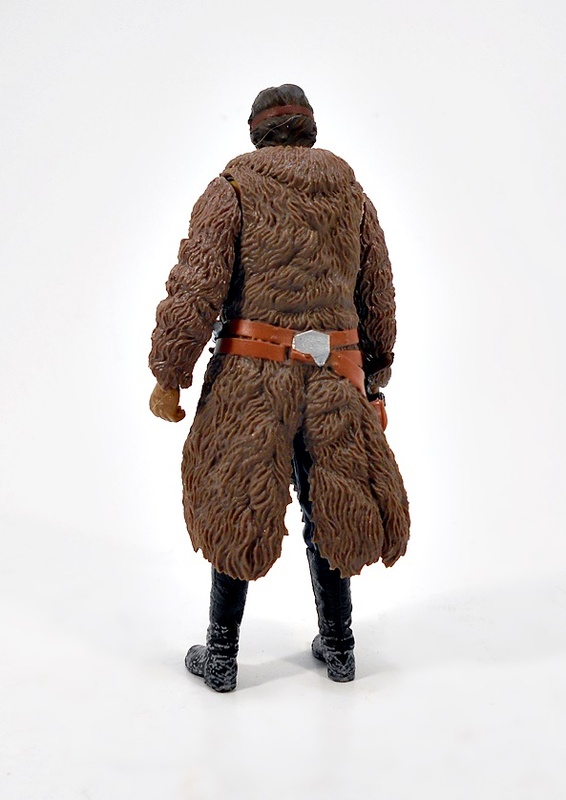 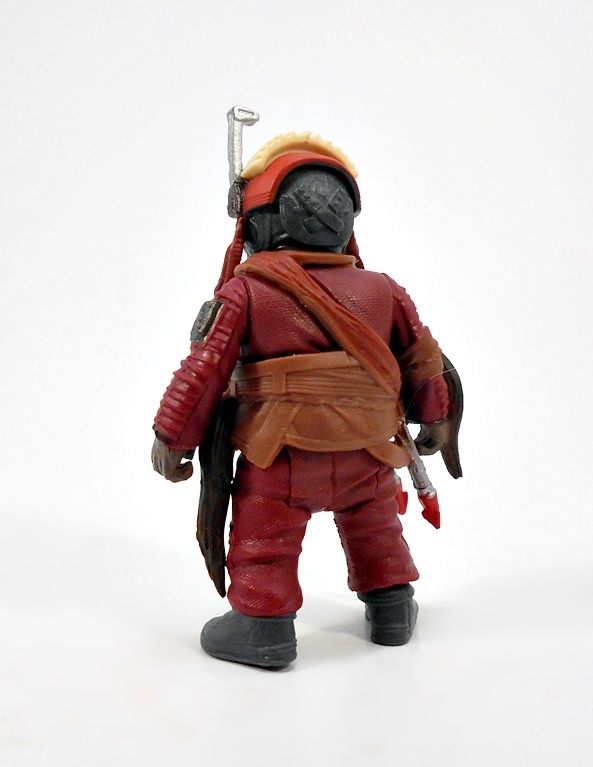 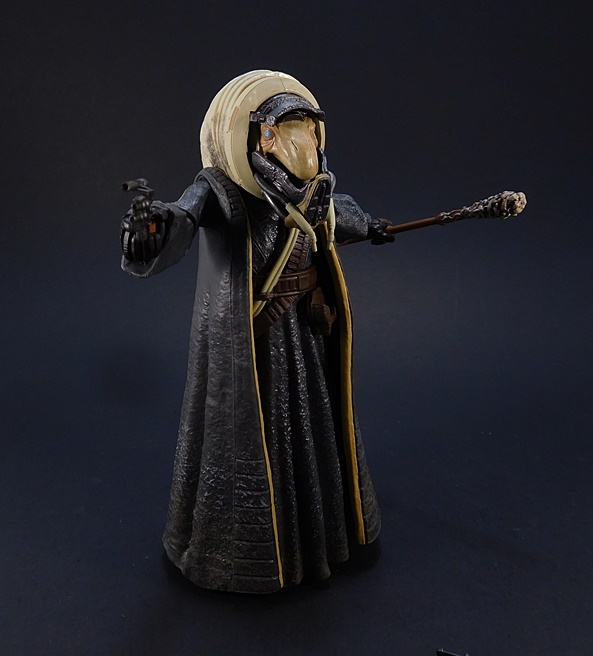 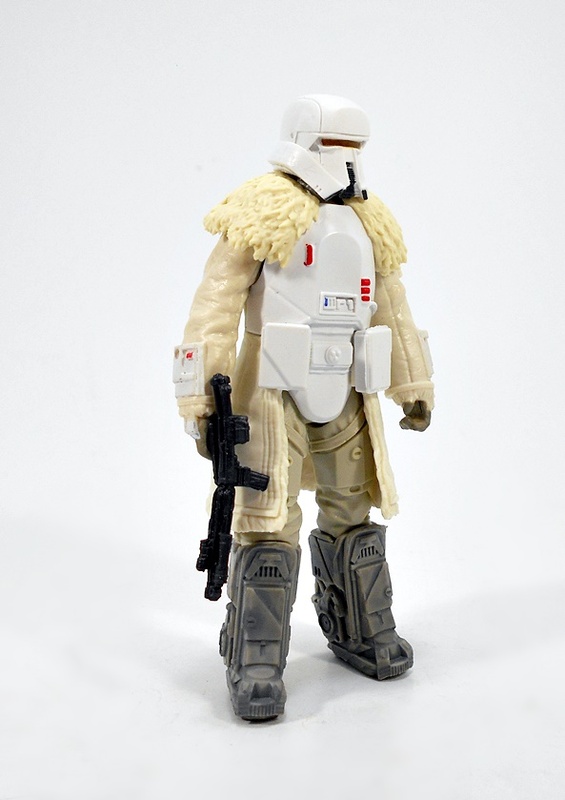 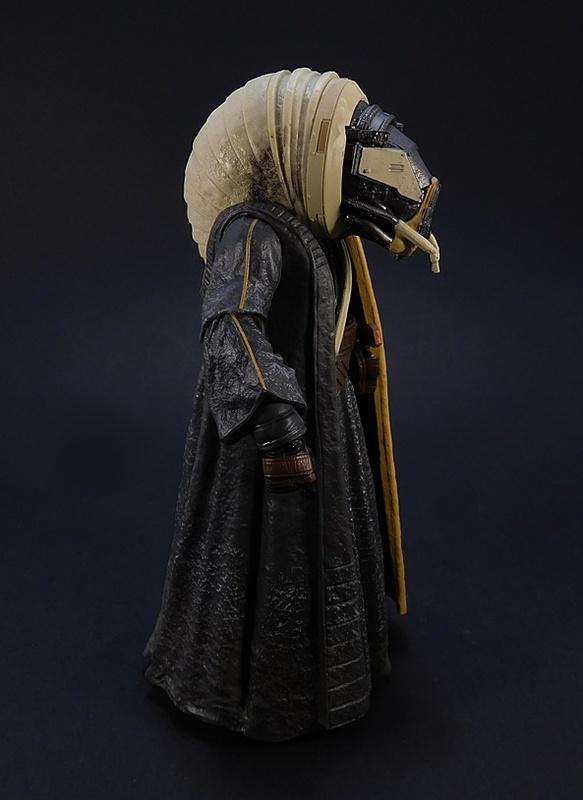 Here’s a case where I really wish Hasbro had gone for softgoods for this Moloch’s robes. 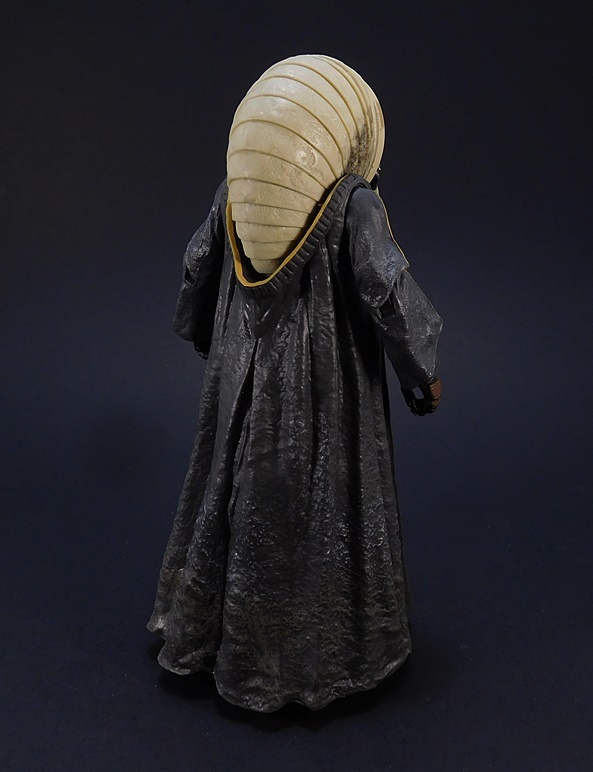 It would have allowed me to get a much better look at the worm body under there, but I suppose you could argue that the costume wouldn’t have looked as good. 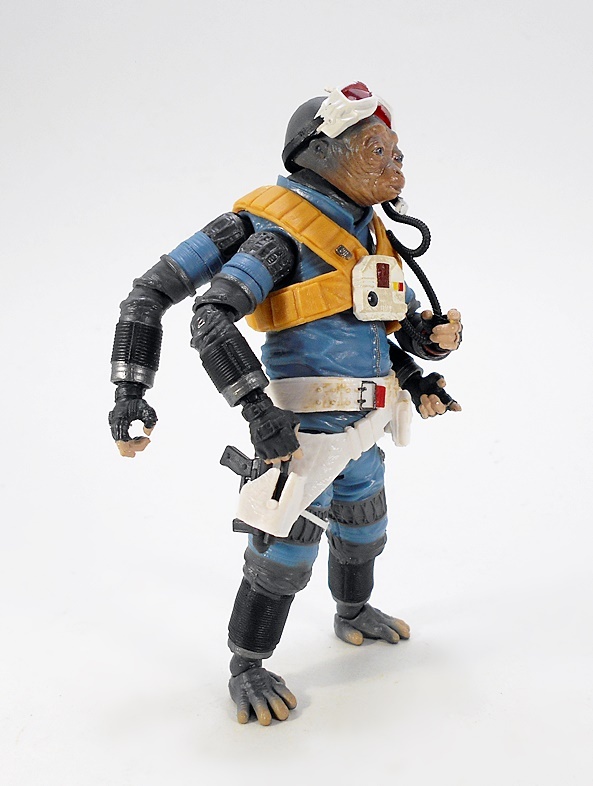 Either way, being a worm means that there aren’t a lot of points of articulation on this fellow. 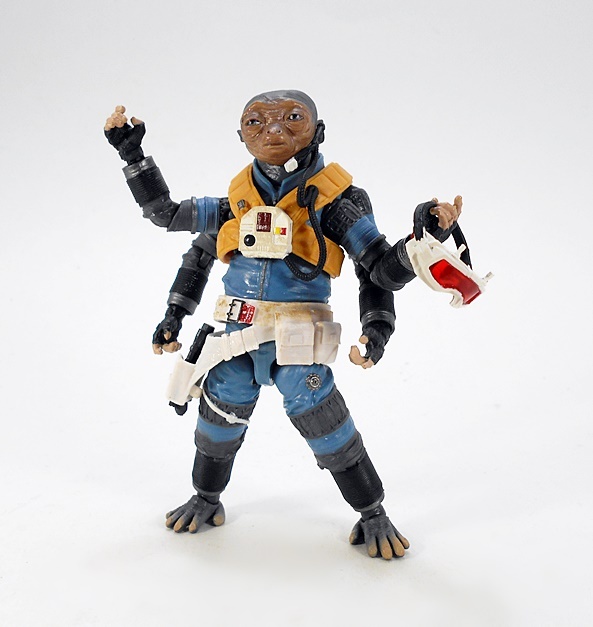 The arms have the usual rotating hinges in the shoulders, elbows, and wrists, but apart from a ball joint in the waist, that’s all you get. 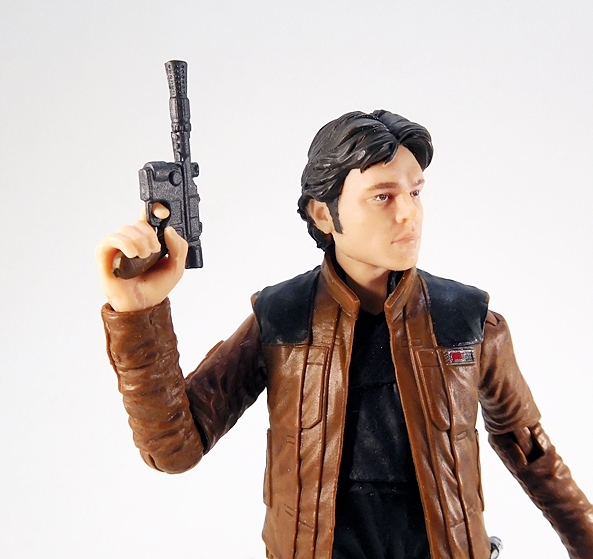 The figure comes unmasked in the package, but I started out with his face all closed up. 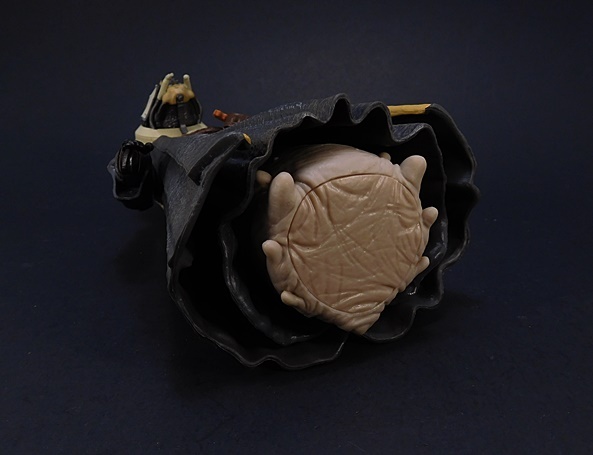 The covered worm body protrudes out of the robes and hunches over to have the “head” encased in a giant ring and mask with breathing apparatus. 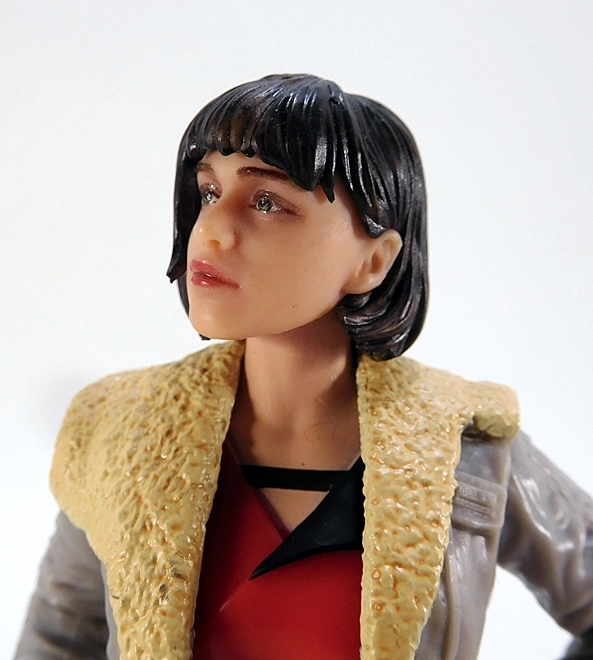 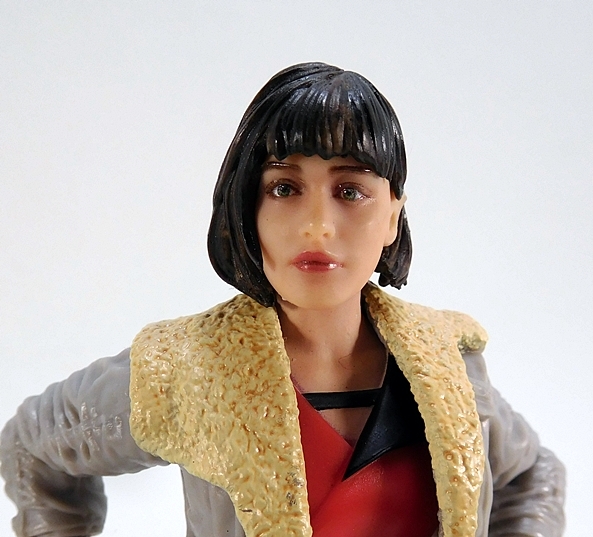 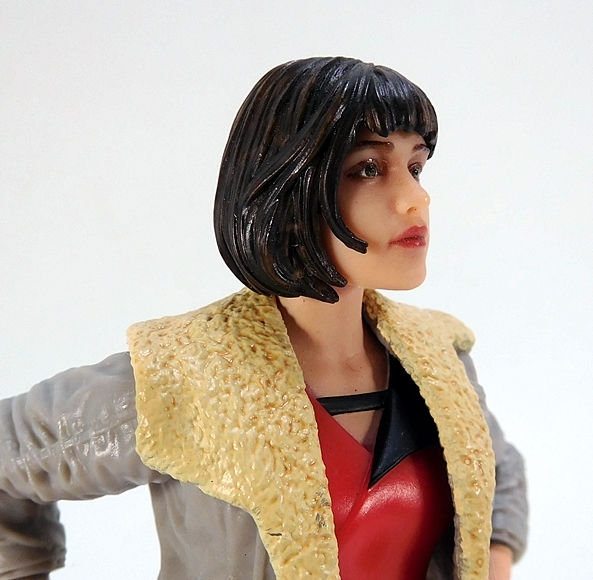 There’s some particularly nice attention to detail here in the sculpt. 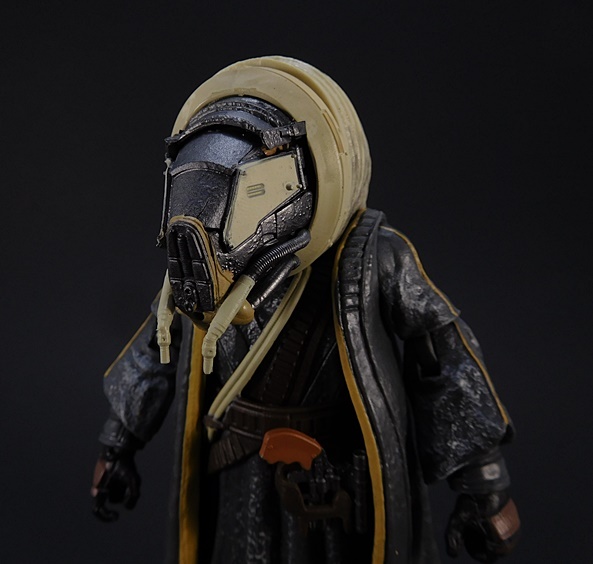 The surface of the mask looks pitted and old in some areas, there’s further detailing on the flat “nose” piece, and the segmented tubes that come out the sides are a nice touch. 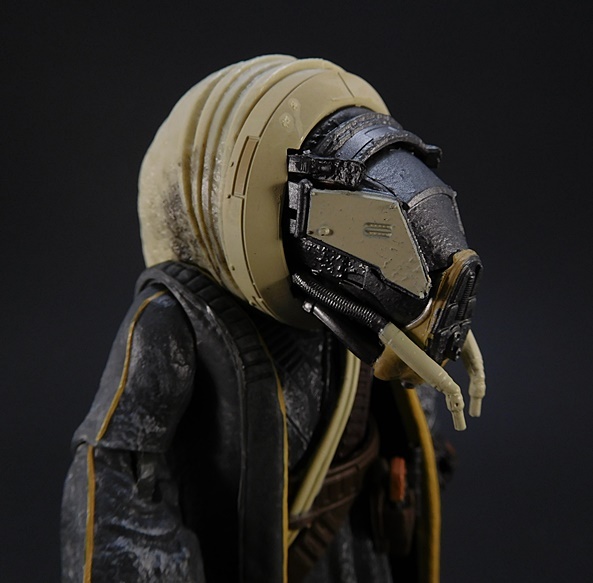 The bulk of the mask is not removable, but the face plate can be taken off to get a look at Moloch’s real mug inside. 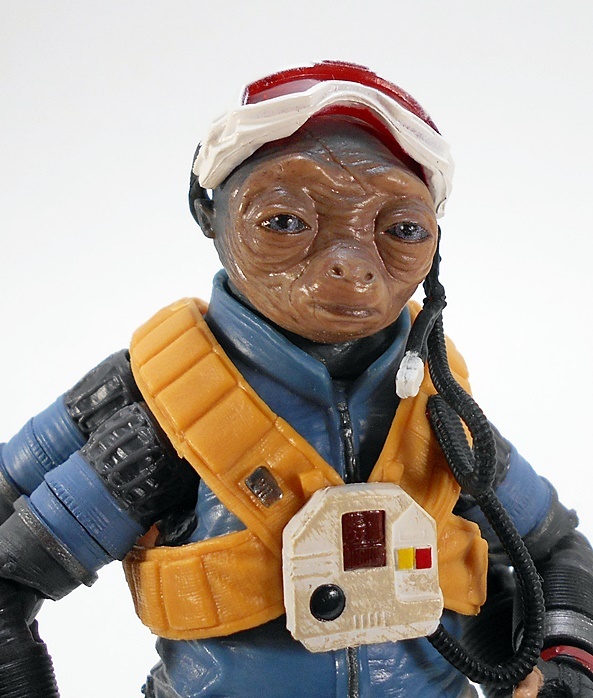 And it turns out he’s a blue-eyed slug. 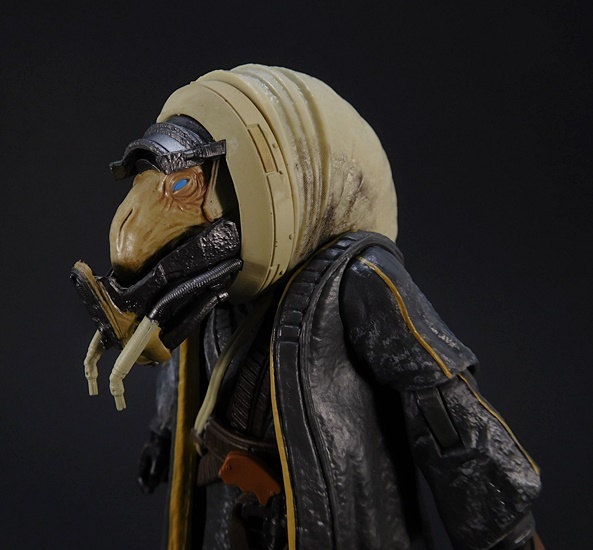 Hasbro did a fantastic job with the sculpting and paint on the worm head. 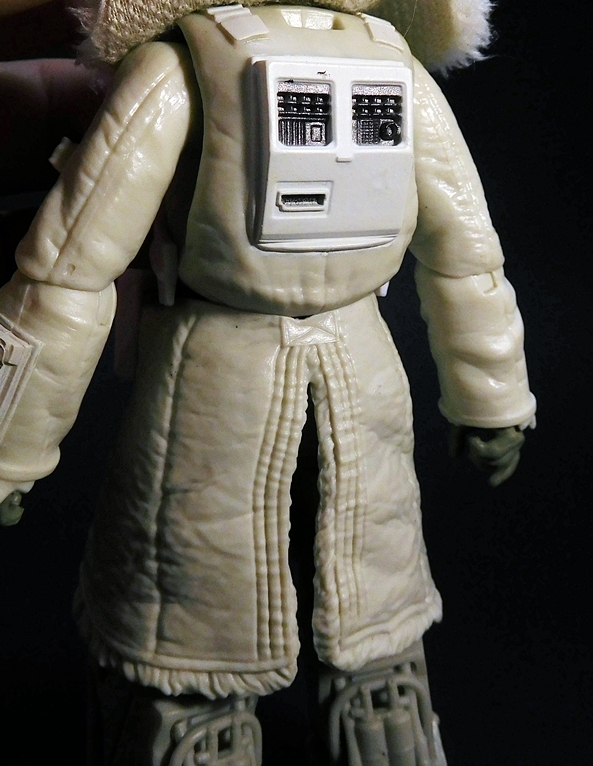 He’s got some cool wrinkling around his eyes and a pair of slits for nostrils. 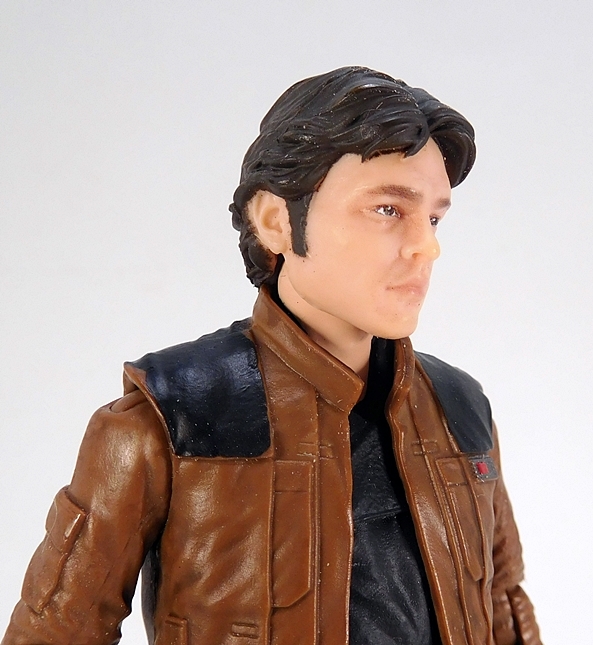 The skin tone has some different shades and there’s a slightly glossy finish, which makes the plastic look like honest-to-god alien worm skin. 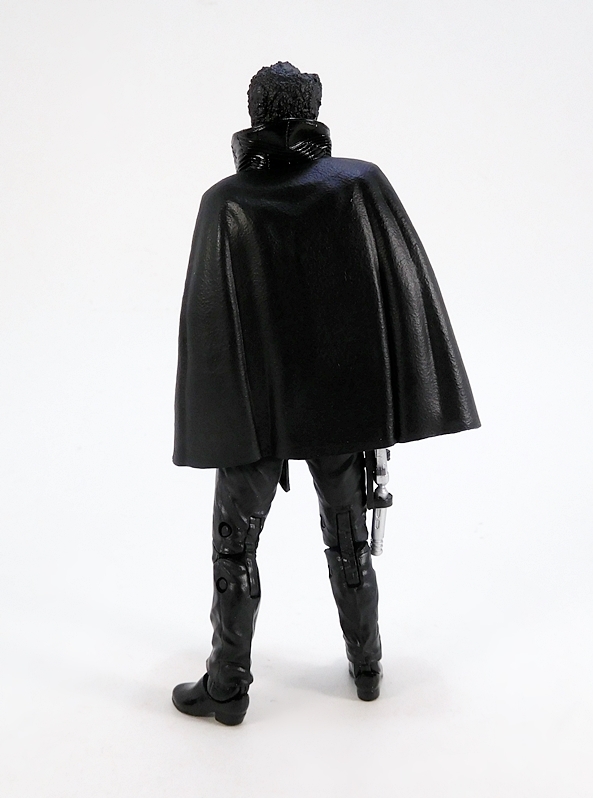 Obviously, the removable mask isn’t a surprise, since the figure comes packaged with it off, but this feature still delighted me to no end and goes a long way to make this figure feel like it’s worth the Deluxe price tag. 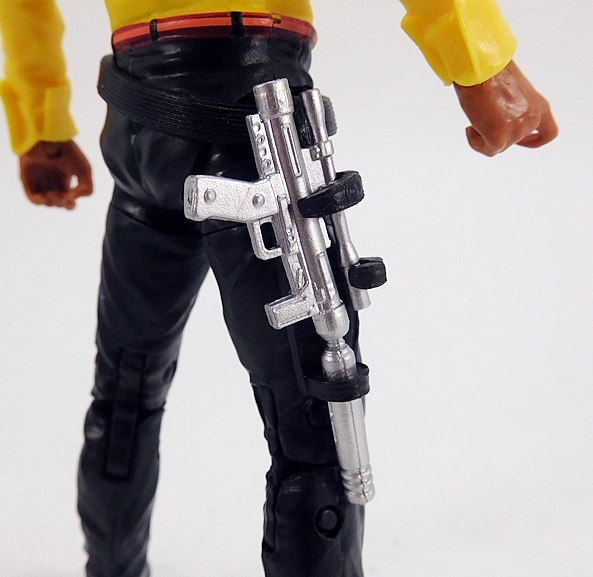 In addition to the removable mask, Moloch comes with two more accessories. 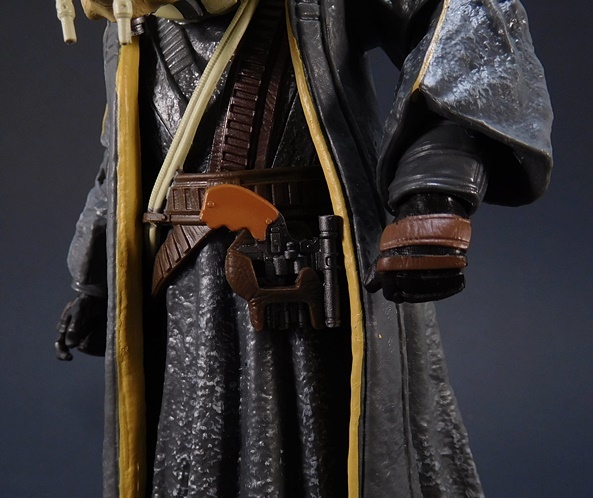 The first is this staff. 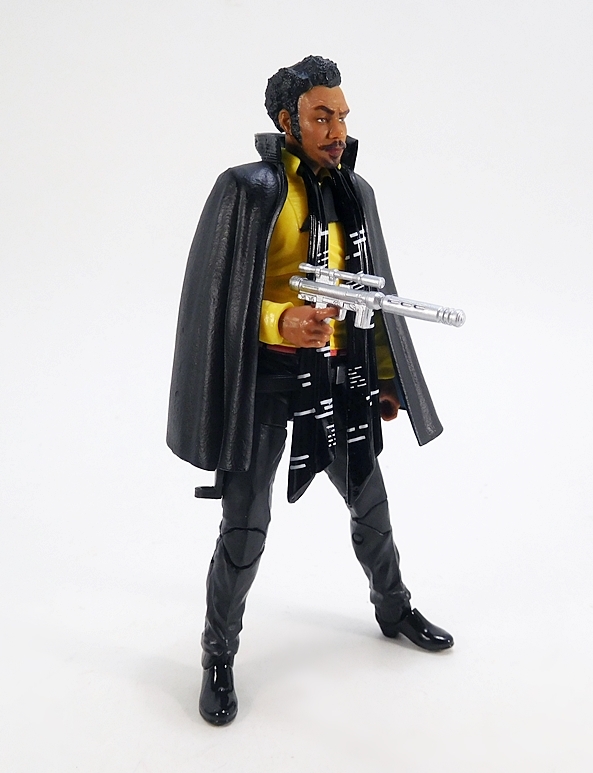 I’m not sure if this is meant to be a weapon, like a mace, or just some kind of badge of office, and I’m not even sure what the disgusting mass is supposed to be at the end. 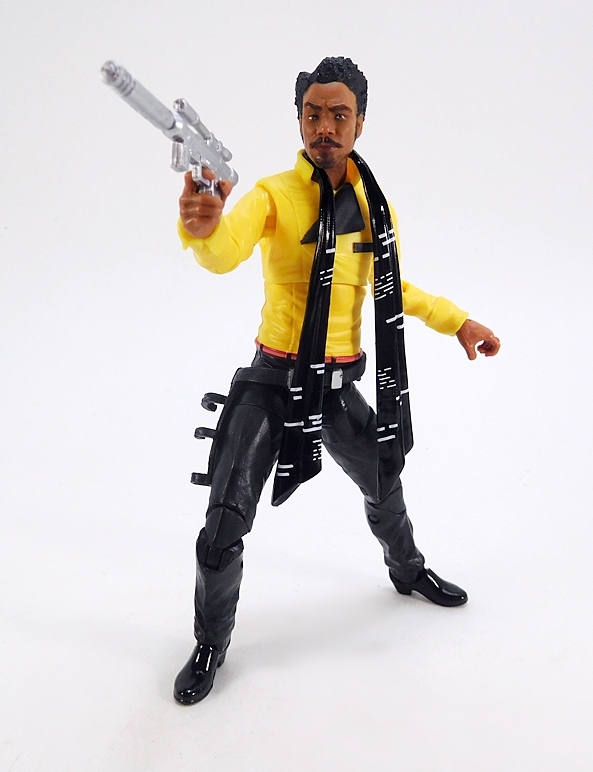 He may just run around threatening to touch people with it. 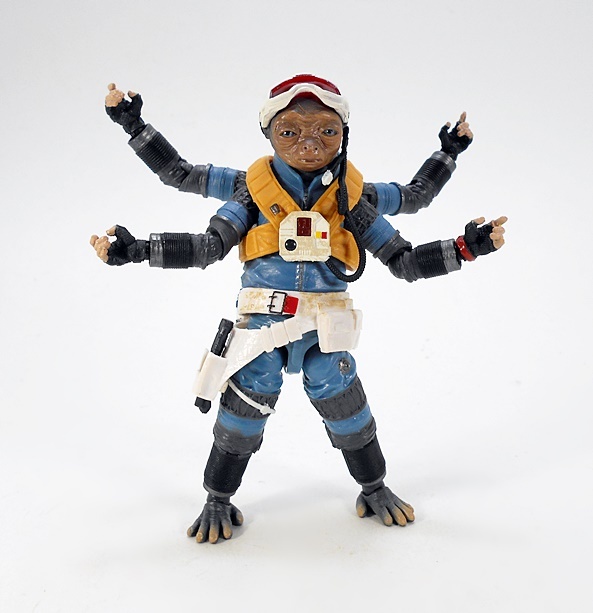 Either way, he can hold it well in his left hand. 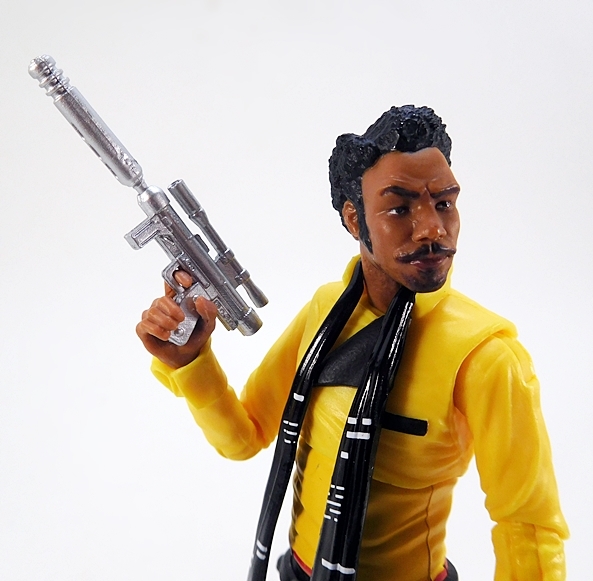 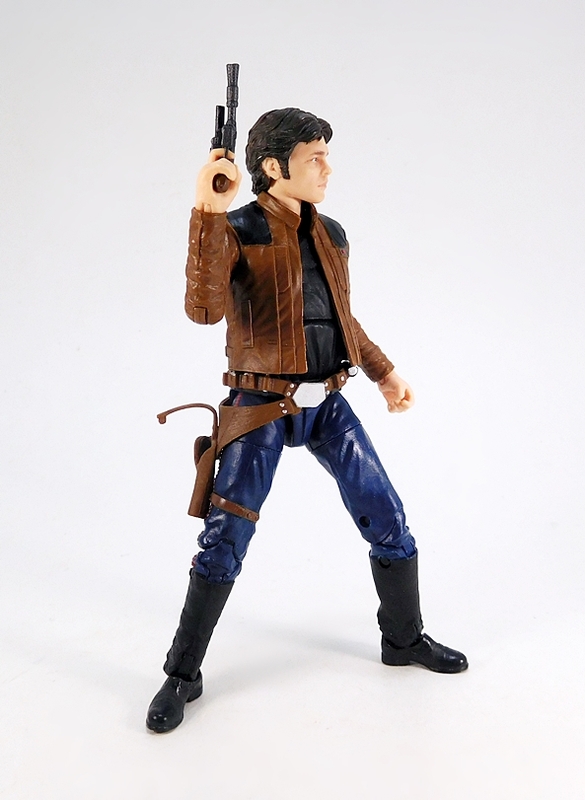 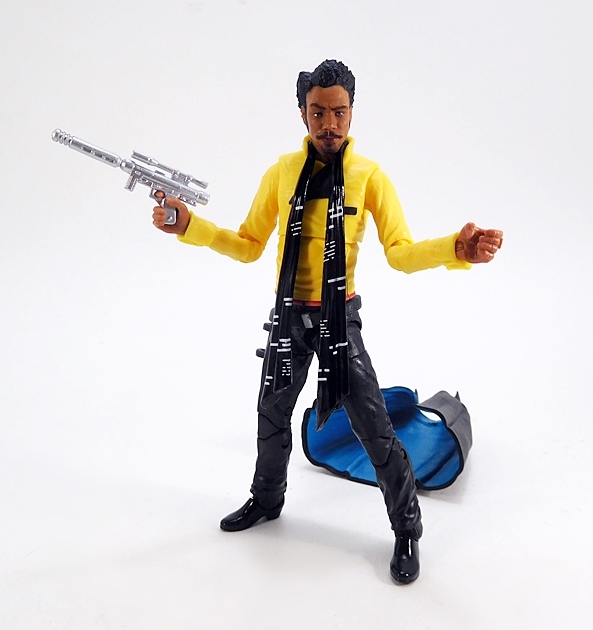 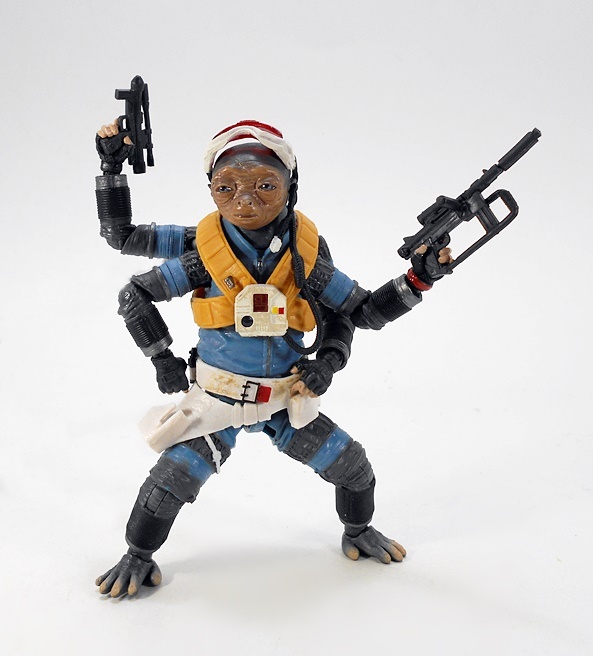 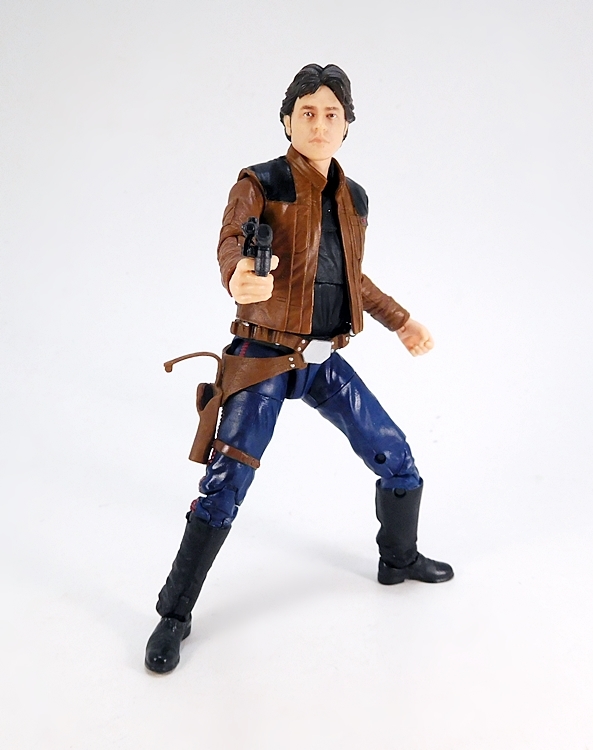 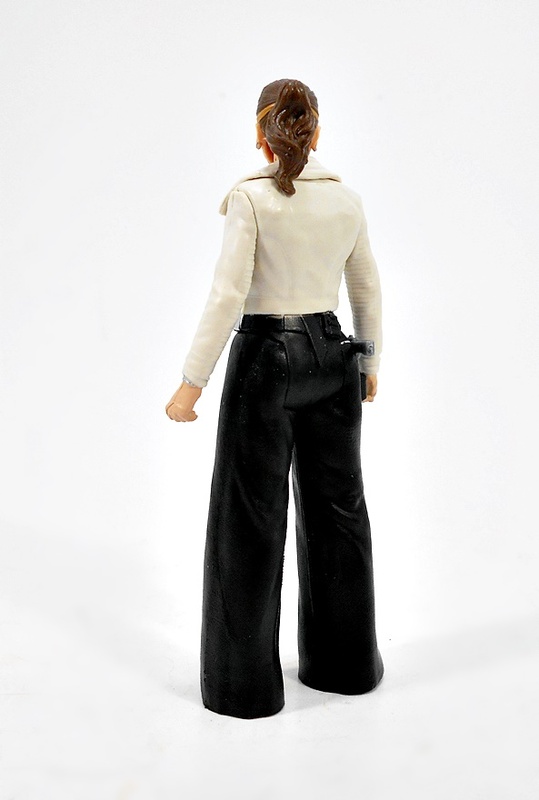 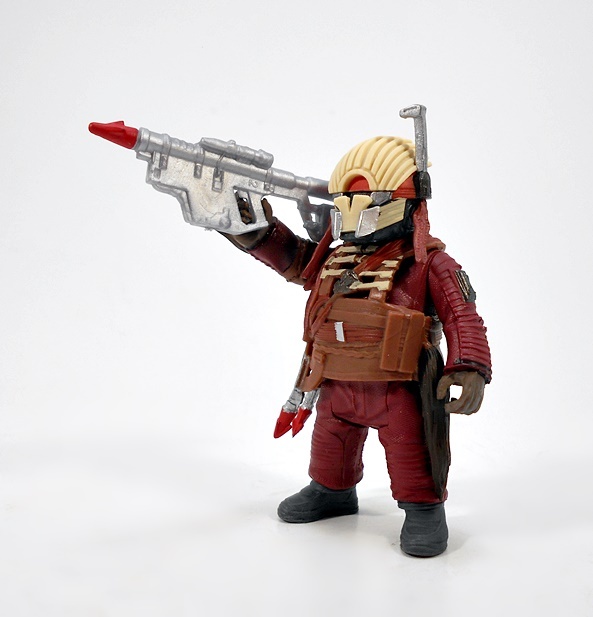 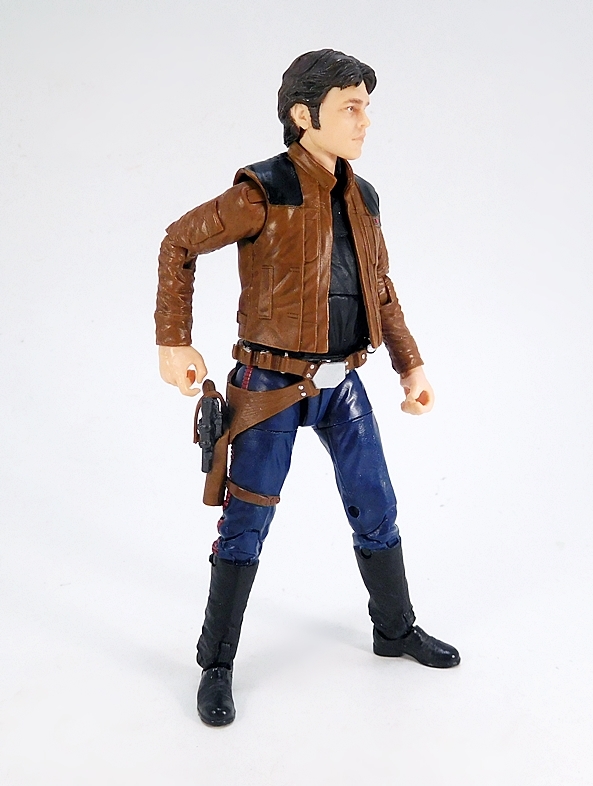 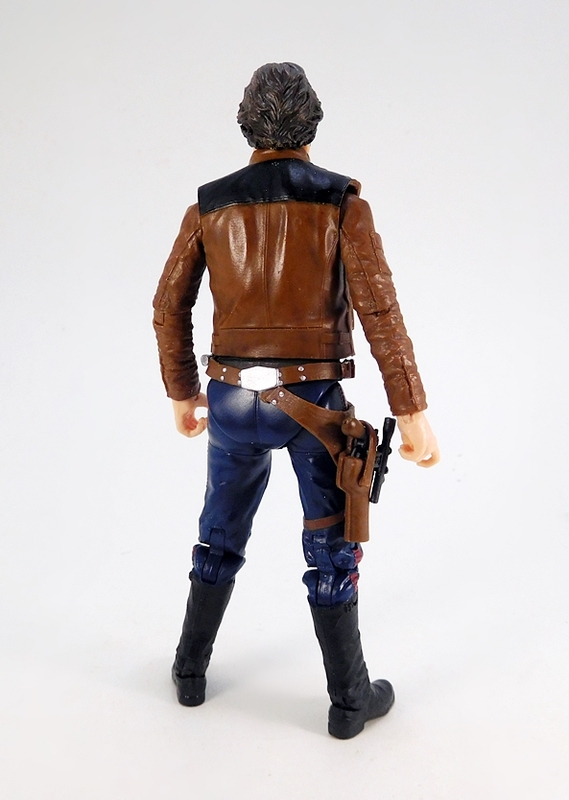 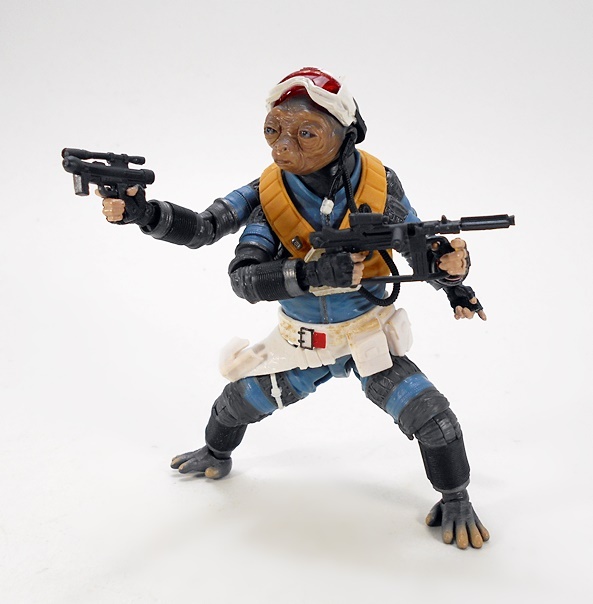 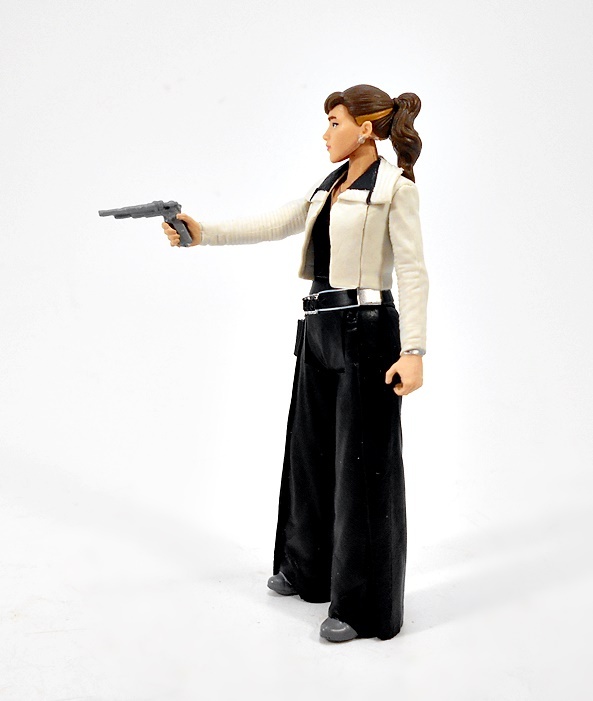 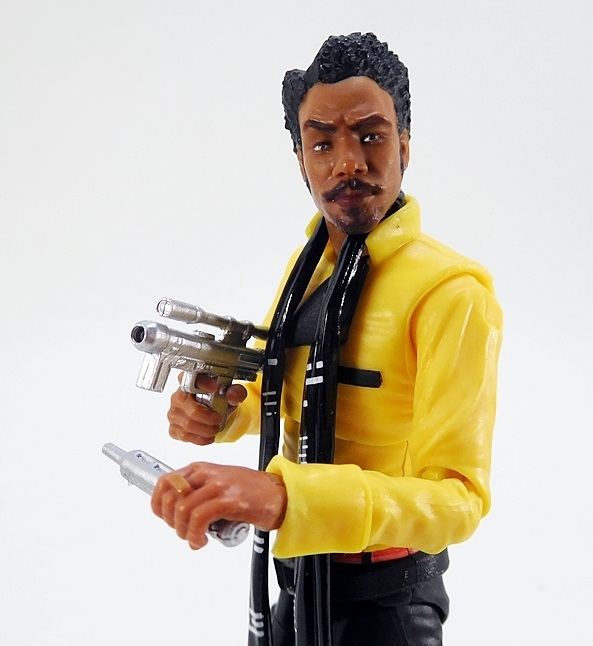 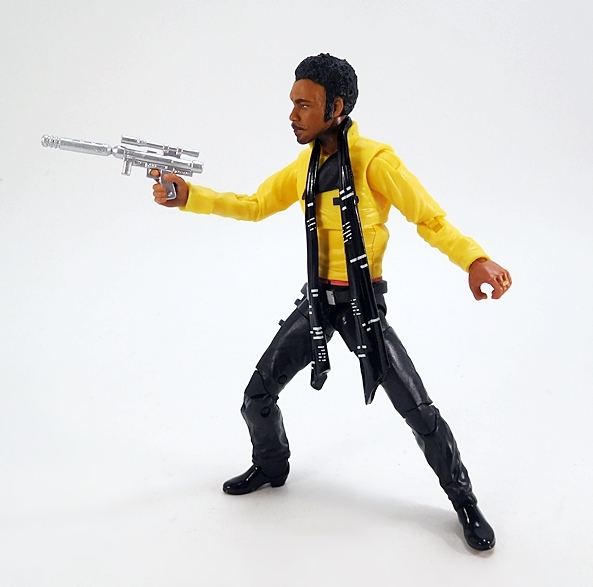 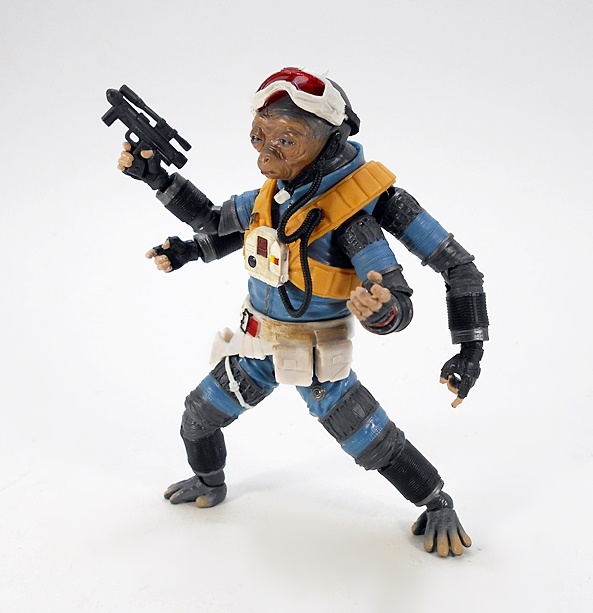 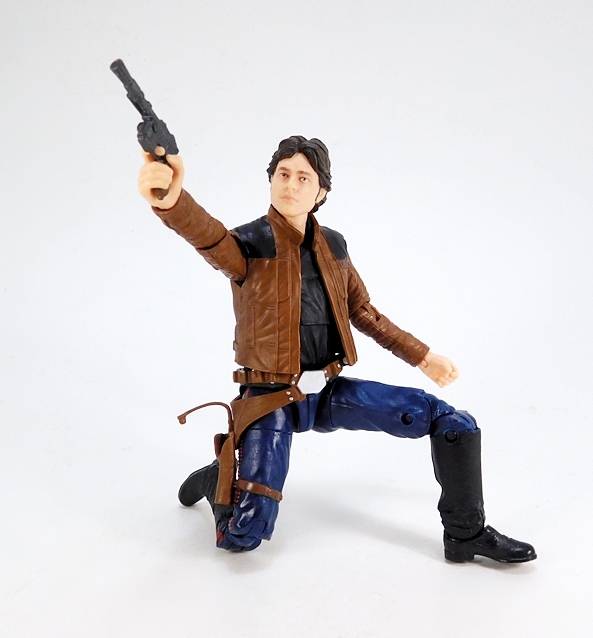 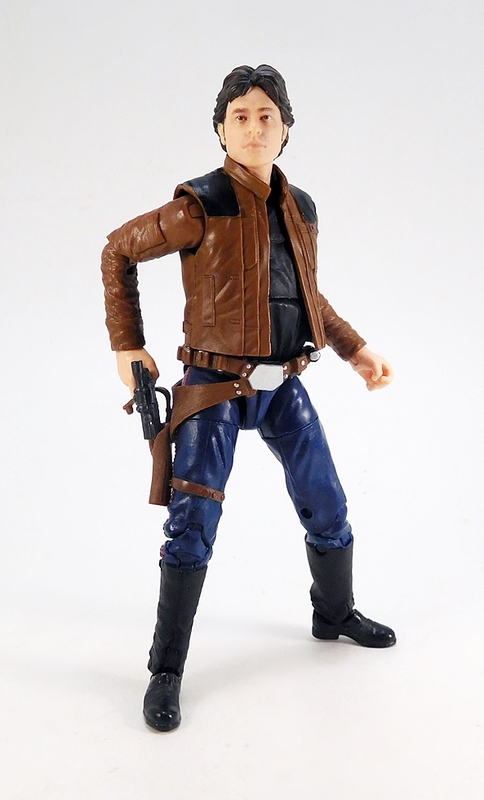 The second accessory is his blaster pistol, which can be worn on the holster on his belt. 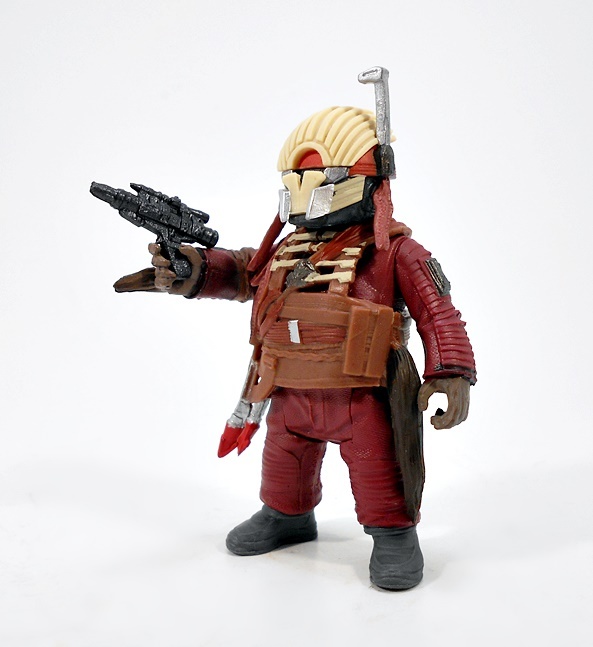 I’ve been a big fan of the blaster designs in some of the new Star Wars movies in general, but definitely in Rogue One and Solo in particular, and this little gun is a good example of why. 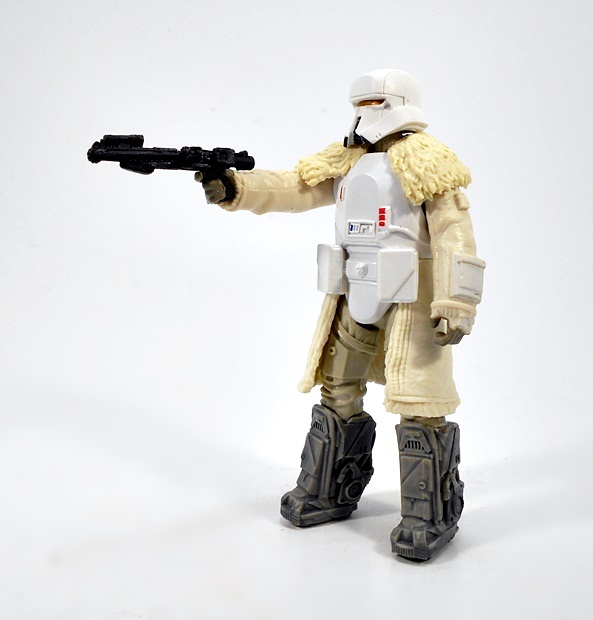 It’s not what I would consider a conventional Star Wars design, but it has that same sense of a realistic looking firearm modified with sci-fi bits. 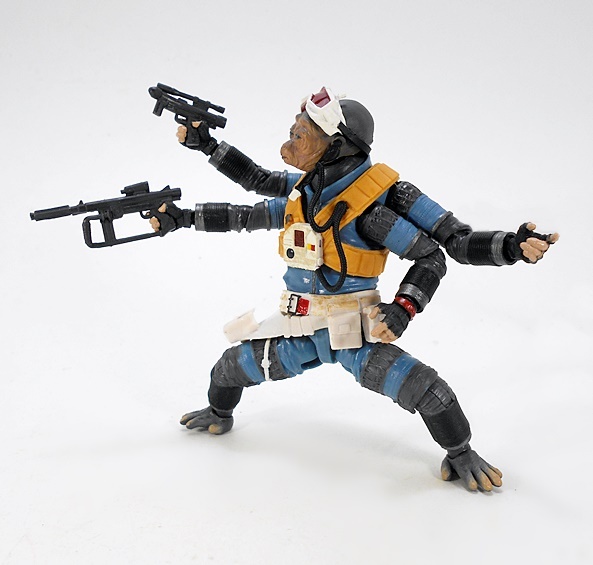 I also really dig that they actually painted the wood grips. 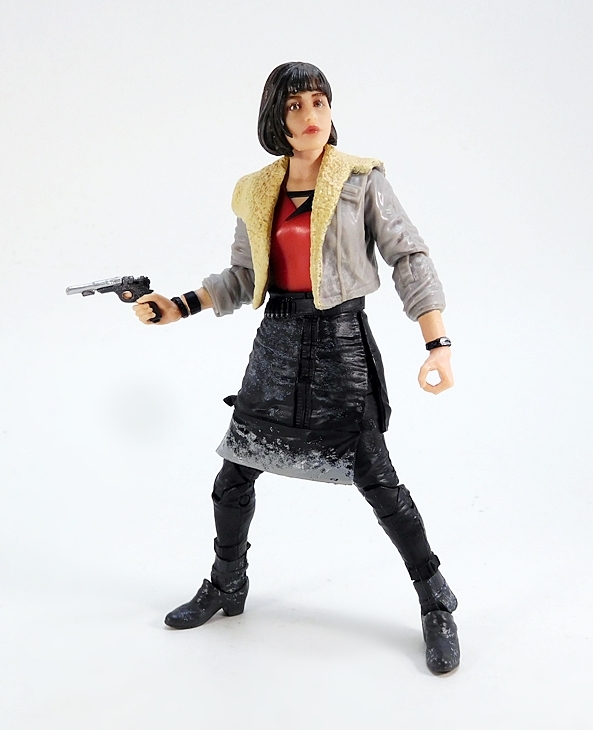 Unlike the other Deluxe Target Exclusive in this line, Moloch was really easy for me to find. 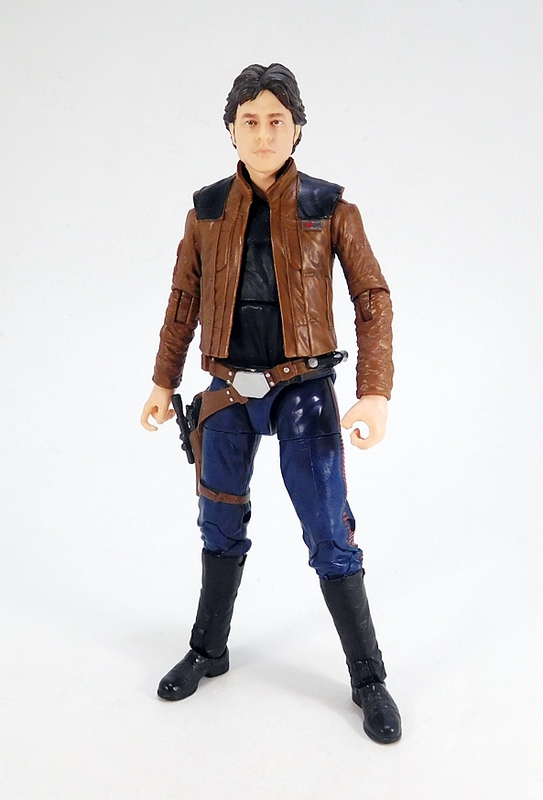 My Target had three of him on the shelf and he’s still been there the last few times I’ve been through the toy aisle. 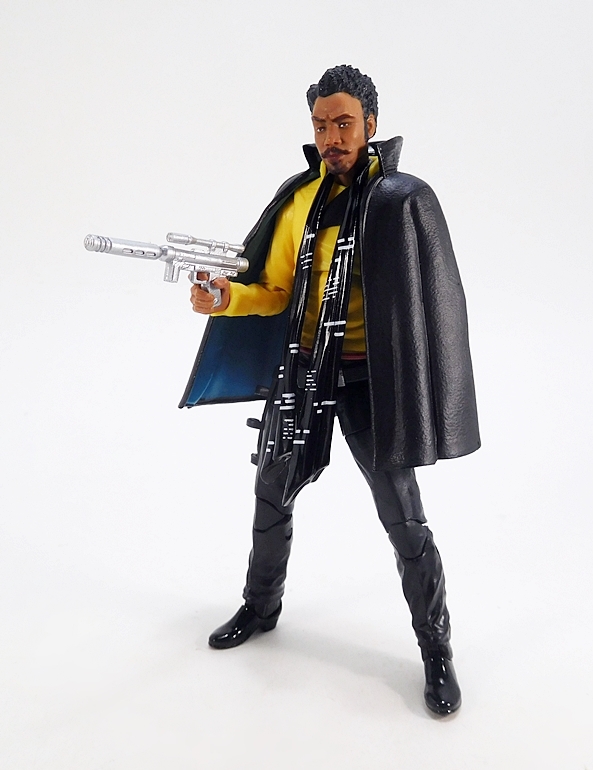 Granted, he’s not an army builder and maybe not as iconic a character as that Green Space Pig, but he is in excellent figure and I’m very glad I picked him up. 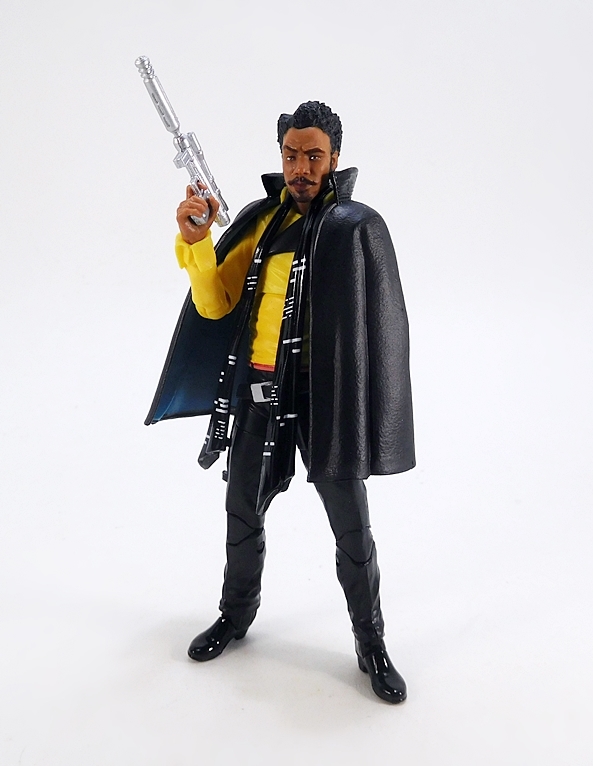 The extra $10 he runs is somewhat justified by the larger size of the figure, although I can’t help but think that if this was a Marvel Legends he would have been the same price as a regular figure. 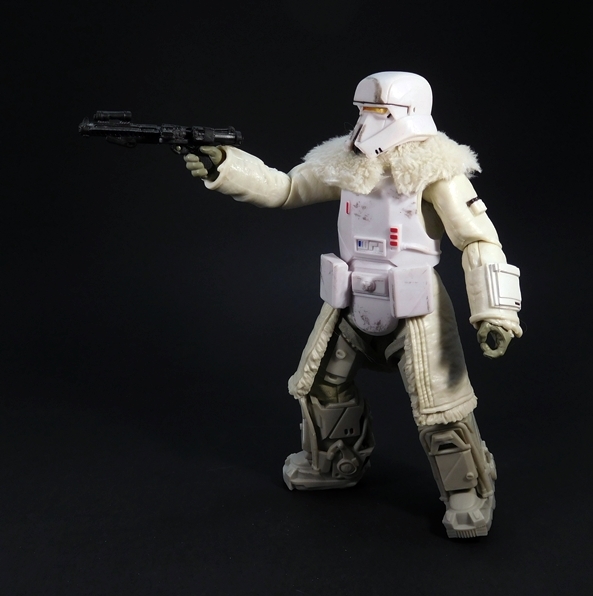 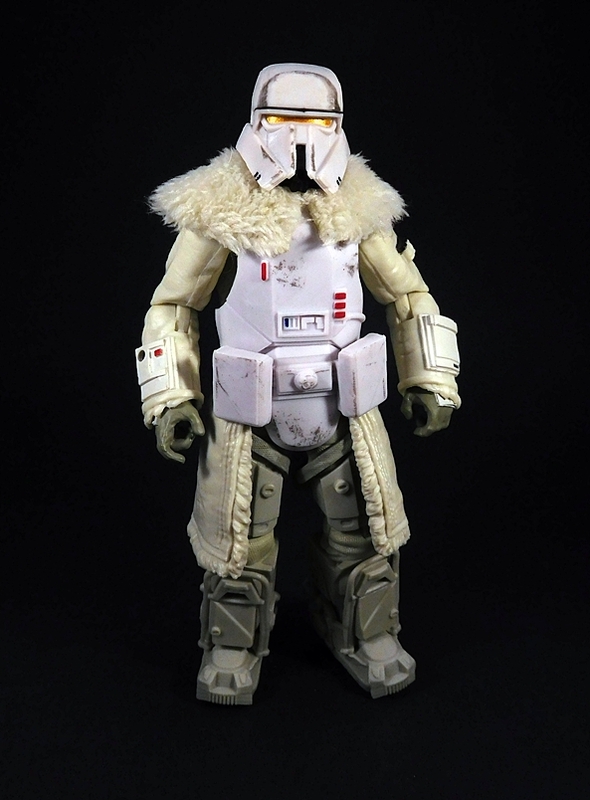 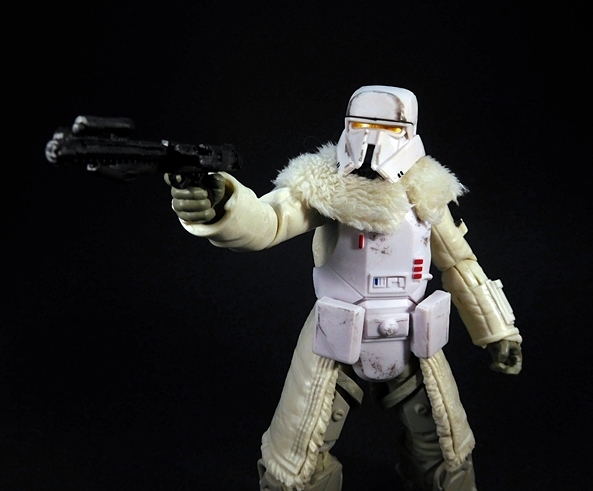 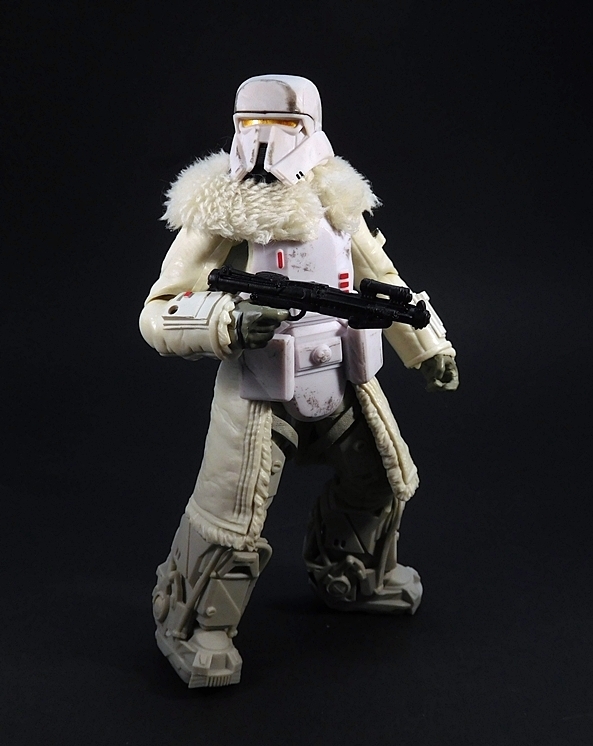 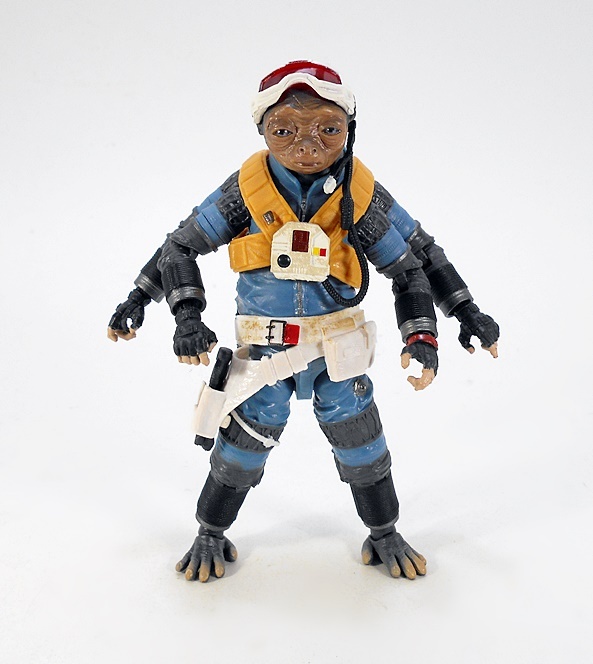 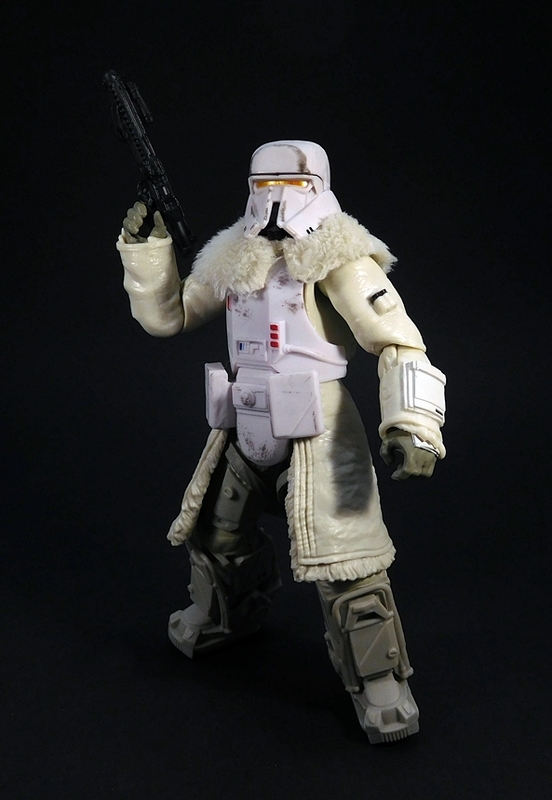 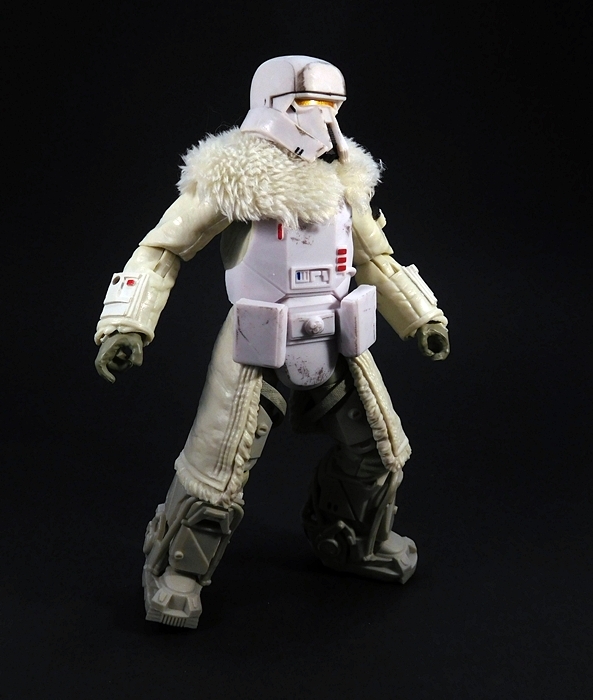 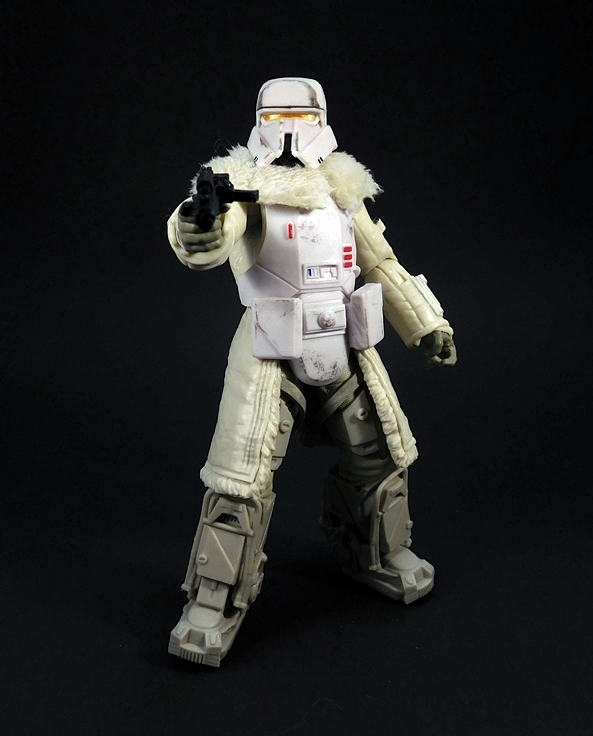 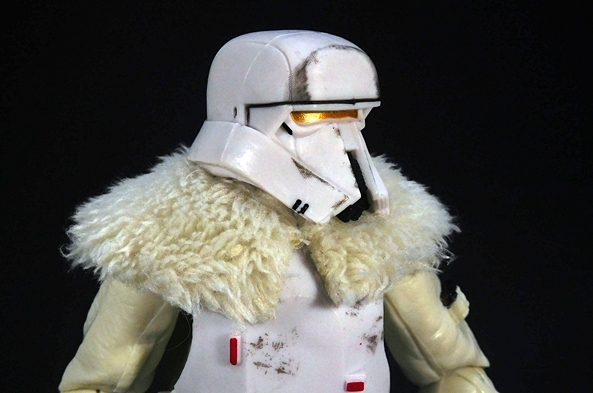 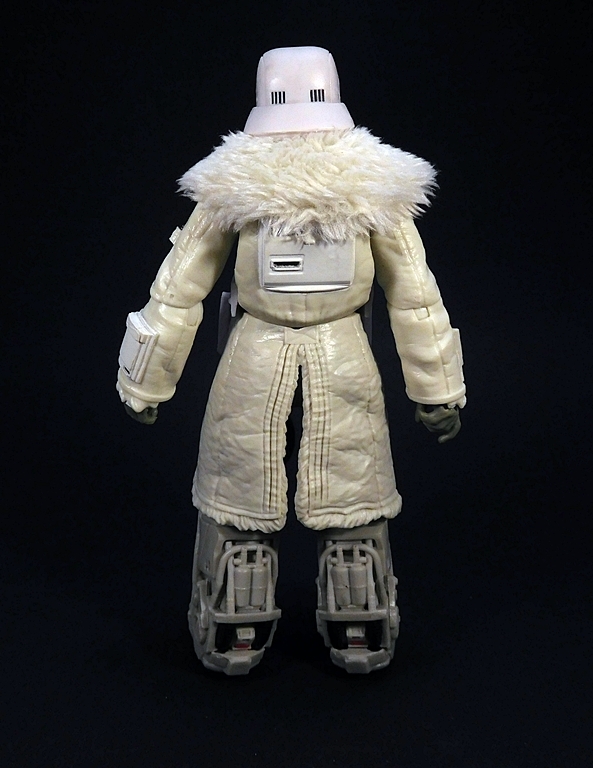 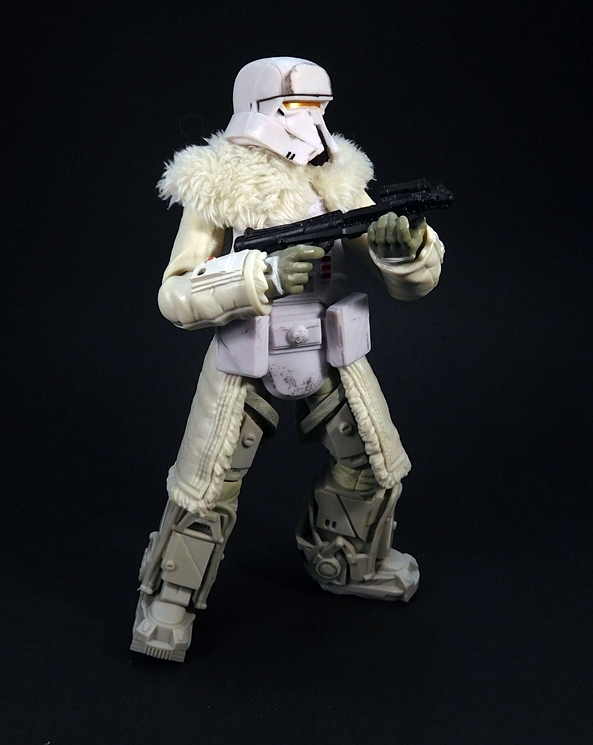 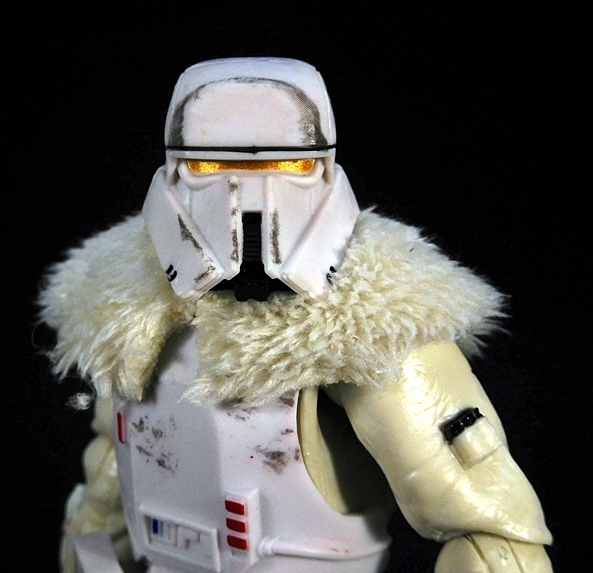 I think the biggest missed opportunity is not giving him a Corellian Hound. 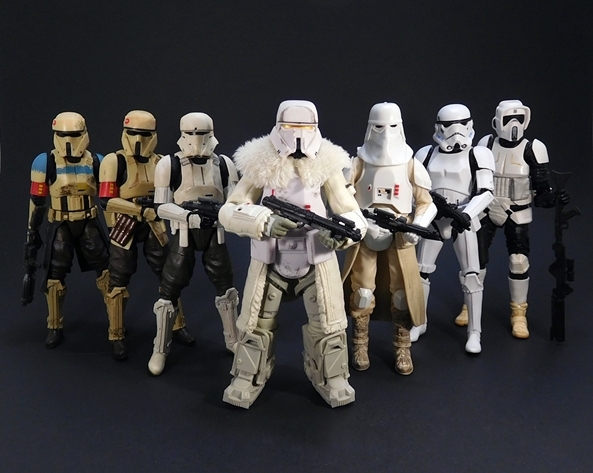 I would have happily ponied up a little extra to get one of them!